A method of combining a first phosphor material and a second phosphor material and devices made therefrom. The method includes providing a first phosphor material, combining the first phosphor material with a host matrix to create a first phosphor mixture, curing the first phosphor mixture at one or more predetermined temperatures, and depositing the cured first phosphor mixture onto a substrate having a second phosphor material. The first phosphor material includes red emission phosphor particles and the second phosphor material includes yellow emission phosphor particles and the host matrix includes a silsesquioxane host material, silsesquioxane-silicate host material, a sol gel host material, or an alkali/silicate water glass host material. 本申请要求2013年08月5日提交的美国申请第61/862279号的优先权，其全文通过引用结合于此。  This application claims the United States August 5, 2013 filed No. 61/862279, incorporated herein by reference in its entirety. 已知电致发光灯或装置的各种实施方式，其中基于发光二极管(LED)来产生白光。  Various embodiments are known electrical lamp or electroluminescent device, wherein a light emitting diode (LED) to generate white light. 一种实施方式基于使用转换发光体，其通常称作磷光剂。 An embodiment based on the use converting light, which is generally referred to as phosphor. 其它实施方式使用量子点。 Other embodiments using quantum dots. LED的初级发射的一部分(大多数是波长范围约460nm的蓝色)可通过磷光剂来吸收，并作为在更高波长的次级辐射再次发射。 Primary part of the LED emission (mostly blue wavelength range of about 460nm) may be absorbed by the phosphor, and as a secondary radiation emitted again at higher wavelengths. 发射波长通常在500nm(绿色)到630nm(红色）的范围变化。 Emission wavelength 500 nm typically varies in the range (green) to 630nm (red). 如果磷光剂与互补颜色的发射一起使用，可额外地实现白色发射。 If used together with the phosphor emission complementary colors, white emission can be additionally achieved. 然而，为了形成暖色系的白光（2700-3500K)，红色磷光剂应与黄色磷光剂组合使用。  However, in order to form the white light warm color (2700-3500K), it should use a red phosphor and a yellow phosphor in combination. 因为红色磷光剂的宽发射以及红色磷光剂的较低的效率，常规溶液提供不足的颜色再现、低效的辐射能量(辐射功率)利用和技术上复杂的构造。 Because of the low efficiency of conventional solution broad emission phosphor and a red phosphor is a red color reproduction provides insufficient, inefficient radiation energy (radiation power) and the use of technically complicated construction. 本发明总体涉及照明，具体来说，涉及具有高效率和高颜色再现的LED、LED灯泡和电致发光装置。  The present invention generally relates to illumination, and in particular, relates to an LED, LED lamp, and high electrical efficiency and color reproduction of the electroluminescent device. -些实施方式提供具有高效率和高颜色再现的用于照明应用的LED模块。  - Some embodiments provide an LED module having a high efficiency and a high color reproducibility for lighting applications. 示例性实施方式包括红色磷光剂，其可沉积到黄色磷光剂基材上，由此第二荧光颜色的添加拓宽发射的光的颜色空间，这使得通过合适地混合蓝色、黄色和红色贡献来调节发射的颜色。 Exemplary embodiments include a red phosphor, which may be a yellow phosphor deposited onto the substrate, whereby the addition of the second fluorescence color broadens the color space of the light emitted, which makes it by appropriate mixing of blue, red and yellow contribution to adjust the color emitted. -些实施方式提供用于将输入波长转换成输出波长的设置例如波长转换板。  - Some embodiments provide for converting an input wavelength to an output wavelength plate disposed e.g. wavelength conversion. 该波长转换板包含第一磷光剂层和第二磷光剂层，该第一磷光剂层包含在整个第一基质中分布的第一磷光剂颗粒，且该第二磷光剂层包含在整个第二基质中分布的第二磷光剂颗粒，由此第二磷光剂层与第一磷光剂层物理接触，且第二基质包含硅氧烷或倍半硅氧烷主体材料、倍半硅氧烷-硅酸盐主体材料、溶胶-凝胶主体材料或碱性(alkal i)/硅酸盐水玻璃主体材料。 The wavelength converting phosphor plate comprises a first layer and a second phosphor layer, the first layer comprises a first phosphor phosphor particles distributed throughout the first matrix and the second phosphor contained in the entire second layer the second phosphor particle distribution in the matrix, whereby the second phosphor layer is in contact with the first physical phosphor layer, and the second matrix comprises a siloxane or silsesquioxane host material, silsesquioxane - Si salts host material, the sol - gel material or a basic body (alkal i) / silicate waterglass host material. 其它实施方式提供具有至少一个发光二极管和多层结构的照明装置，该至少一个发光二极管适于发射峰值波长在可见光谱区中的基色光(primarylight)，该多层结构具有第一磷光剂层和第二磷光剂层，该第一磷光剂层包含在整个第一基质中分布的第一磷光剂颗粒，且该第二磷光剂层包含在整个第二基质中分布的第二磷光剂颗粒。  Other embodiments provide a lighting device having at least one light emitting diode and a multilayer structure, which is adapted to the at least one light emitting diode peak emission wavelength in the visible spectral region of primary light (primarylight), the multilayer structure having a first phosphor a phosphor layer and a second layer, the first layer comprises a first phosphor phosphor particles distributed throughout the first matrix and the second layer comprises a second phosphorescent phosphor distributed throughout the second matrix particles. 该第二磷光剂层可物理接触第一磷光剂层，且第二基质包含硅氧烷或倍半硅氧烷(silsesquioxane)主体材料、倍半硅氧烷-硅酸盐主体材料、溶胶-凝胶主体材料或碱(alkali)/硅酸盐水玻璃主体材料。 The second phosphor layer may be in physical contact with the first phosphor layer, and the second matrix comprises a siloxane or silsesquioxane (silsesquioxane) host material, silsesquioxane - silicate host material sol - condensate plastic material body or base (alkali) / silicate waterglass host material. 其它实施方式提供具有至少一个发光二极管和多层结构的照明装置，该至少一个发光二极管适于发射峰值波长在可见光谱区中的基色光，该多层结构具有第一磷光剂层和第二磷光剂层，该第一磷光剂层包含在整个第一基质中分布的发射黄光的磷光剂颗粒，该第二磷光剂层接触第一磷光剂层并包含在整个第二基质中分布的发射红光的磷光剂颗粒。  Other embodiments provide a lighting device having at least one light emitting diode and a multi-layer structure, the at least one light emitting diode is adapted to emit primary light peak wavelength in the visible spectrum region, the multilayer structure having a first phosphor layer and the second phosphor layer, the phosphor layer comprises a first yellow-emitting phosphor particles distributed throughout the first matrix, the second phosphor layer contacting the first phosphor layer and comprising a second distributed throughout the matrix red-emitting phosphor particles. 第二基质包含硅氧烷或倍半硅氧烷主体材料、倍半硅氧烷-硅酸盐主体材料、溶胶-凝胶主体材料或碱/硅酸盐水玻璃主体材料，且该第二磷光剂层不包含陶瓷氧化物前体。 The second matrix comprises a siloxane or silsesquioxane host material, silsesquioxane - silicate host material, the sol - gel material body or base / silicate waterglass host material, and the second phosphor layer does not comprise a ceramic oxide precursor. 各种实施方式还包含组合第一磷光剂材料和第二磷光剂材料的方法。  Various embodiments of the method further comprises a combination of a first material and a second phosphor material of the phosphor. 该方法包含提供第一磷光剂材料，组合第一磷光剂材料与主体基质来构建第一磷光剂混合物，在一种或多种预定的温度下固化该第一磷光剂混合物，和将该固化的第一磷光剂混合物沉积到具有第二磷光剂材料的基材上。 The method includes providing a first phosphor material, the first phosphor in combination with the host matrix material to build the first phosphor mixture, the phosphor mixture is cured first at one or more predetermined temperature, and the cured the first phosphor mixture is deposited onto the substrate having a second phosphor material. 在以下的详细描述中给出了要求保护的主题内容的其他特征和优点，其中的部分特征和优点对本领域的技术人员而言，根据所作描述就容易看出，或者通过实施包括以下详细描述、权利要求书以及附图在内的本文所述的要求保护的主题而被认识。  Other features and advantages of the given subject matter claimed in the following detailed description, in which the part features and advantages to those skilled in the art, it is readily apparent from that description, or by the embodiment comprising detailed description, claims, and drawings herein, including the claimed subject matter is recognized. 应理解，前面的一般性描述和以下的详细描述介绍了各种实施方式，用来提供理解要求保护的主题的性质和特性的总体评述或框架。  It should be understood that both the foregoing general description and the following detailed description of the various embodiments described embodiment, to provide an understanding of the claimed overview or framework for the nature and character of the subject matter. 包括的附图提供了对本发明的进一步的理解，附图被结合在本说明书中并构成说明书的一部分。 Accompanying drawings are included to provide a further understanding of the invention, the accompanying drawings are incorporated in a part of the present specification and constitute a specification. 附图以图示形式说明了本文所述的各种实施方式，并与说明书一起用来解释要求保护的主题的原理、操作和变体。 The drawings illustrate various embodiments described herein, in diagrammatic form, and with the description serve to explain the principles of the claimed subject matter, the operation and variants thereof. 提供这些附图只是为了说明性目的，应理解本文所述的和所讨论的实施方式不限于所示的设置和手段。  These drawings are provided for illustrative purposes only, it should be understood that the embodiments discussed herein and is not limited to the arrangements and instrumentalities shown. 图1是色度图表，其显示与眼睛响应卷积(convolved)的各种颜色点。  FIG. 1 is a chromaticity diagram showing the convolution (convolved) of each color point in response to the eye. 图2A-2F显示根据示例性实施方式的各种倍半硅氧烷主体材料。  Figures 2A-2F show various silsesquioxane host material according to an exemplary embodiment. 图3显示根据一些实施方式的示例性固化过程。  FIG. 3 shows an exemplary curing process in accordance with some embodiments. 图4A-4C提供由实施方式形成的示例性涂层的图形化显示。  Exemplary patterned coating formed Figures 4A-4C provided by the embodiment shown. 图5是由一些实施方式形成的示例性涂层的图形化显示。  FIG. 5 is a graphical representation of an exemplary coating formed by a number of embodiments displayed. 图6是由一些实施方式形成的示例性涂层的图形化显示。  FIG. 6 is a graphical representation of an exemplary coating formed by a number of embodiments displayed. 图7显示本发明的一实施方式和下面的黄色磷光剂基材的比较。  Figure 7 shows a comparative embodiment and the following embodiment of the present invention, a yellow phosphor substrate. 图8显不另一实施方式。  FIG. 8 is not significant to another embodiment. 图9是色度图表，其显示根据一些实施方式的与眼睛响应卷积(convolved)的各种颜色点。  FIG. 9 is a chromaticity diagram showing the convolution (convolved) each color point in response to the eye in accordance with some embodiments. 图10是量子效率与温度的关系图。  FIG. 10 is a relationship between the quantum efficiency and temperature in FIG. 图11显示根据一些实施方式的在表面贴装封装中的白光LED。  FIG. 11 shows a surface-mount white LED package in accordance with some embodiments. 图12显示根据另一些实施方式的在表面贴装封装中的白光LED。  Figure 12 shows the mount white LED package according to other embodiments of the surface. 图13A和13B显示具有根据一些实施方式的具有波长转换板的发光装置。  FIGS. 13A and 13B show a light emitting device having a wavelength conversion panel according to some embodiments. 虽然为了说明和理解本发明可包括细节，但这些细节不应构成对范围的限制，相反只是作为可包含进入特定实施方式和/或说明特定实施方式的特征。  Although for purposes of illustration and understanding of the present invention can include specifics, these specifics should not be construed as limiting the scope, but rather may comprise enter only as particular embodiments and / or features of particular embodiments described. 参考附图描述了用于发光的涂层和装置的各种实施方式，其中相同的元件具有相同的附图标记以便于理解。  Various embodiments are described with reference to the accompanying drawings for the embodiment of the coating and a light emitting apparatus, wherein the same elements have the same reference numerals to facilitate understanding. 还应理解，除非另外指出，术语如"顶部"，"底部"，"向外"，"向内"等是常用词语， 不构成对术语的限制。  It should also be understood that, unless otherwise indicated, terms such as "top," "bottom," "outward," "inward," and the like are commonly used words, not be construed as limiting terms. 此外，描述一个基团为包含元素的基团和它们的组合中的至少一个时，该基团可包含许多所列元素，或单独的或相互的组合，或者由它们组成，或者主要由它们组成。 Also, the description of a group containing at least one of a group of elements and combinations thereof, the group may comprise a number of those elements recited, either individually or in combination with each other, or composed of them, or predominantly consists . 类似的，每当将一个组描述为由一组要素中的至少一个要素或它们的组合组成时，所述组可以单个要素或相互组合的形式由任何数量的这些所列要素组成。  Similarly, whenever a group is described as consisting of at least one element or combinations of elements consisting of a group, the group may be in the form of a single element or in combination consists of any number of those elements recited. 除非另外说明，否则，列举的数值范围同时包括所述范围的上限和下限。 Unless stated otherwise, the recitation of numerical ranges includes both the upper and lower limits of the range. 除非另外说明，否则，本文所用的不定冠词"一个"和"一种"及其相应的定冠词"该"表示至少一(个/种），或者一(个/种)或多(个/种）。 Unless stated otherwise herein, the indefinite articles "a" and "an" and its corresponding definite article with "the" represents at least one (one / species), or a (number / species) or (more / species). 本领域的技术人员将会认识到，可以对所描述的实施方式做出许多改变，而还能获得本发明的有益的结果。  One skilled in the art will recognize that many changes may be made to the described embodiments, but can obtain the beneficial results of the present invention. 还显而易见的是，本发明所需的有益结果中的一部分可以通过选择本发明所述的一些特征而不利用其他的特征来获得。 It is also apparent that part of the desired benefits of the present invention by selecting some of the features of the present invention without utilizing other features is obtained. 因此，本领域技术人员会认识到， 许多更改和修改都是可能的，在某些情况下甚至是希望的，并且是本发明的一部分。 Thus, those skilled in the art will recognize that many changes and modifications are possible, and in some cases even desirable, and is part of the invention. 因此， 提供以下描述作为对本发明原理的说明，不构成对本发明的限制。 Accordingly, the following description is provided as illustrative of the principles of the invention and is not intended to limit the present invention. 本领域普通技术人员将理解，在不偏离本发明的精神和范围的情况下，可对本文所述的示例性实施方式进行许多修改。  This will be understood by those of ordinary skill in the art, without departing from the spirit and scope of the invention, many modifications may be made the exemplary embodiments herein. 因此，该说明书无意于也不应构造成受限于所给出的实施例，但应赋予通过所附权利要求及其等同体所提供的全部的保护范围。 Accordingly, this description is not intended to nor should be constructed as limited to the embodiments given herein, it is to be accorded the full scope of protection provided by the body of the appended claims and their equivalents. 此外，还可使用本发明的一些特征，而相应地不使用其它特征。 In addition, some features of the present invention may also be used, but without a corresponding use of other features. 因此，提供示例或示意实施方式的上述说明，来显示本发明的主题内容的原理，而不构成其限制，且可包括对本发明的修改和置换。 Accordingly, exemplary or illustrative embodiments described above, the subject matter to the display principle of the present invention without limiting its configuration, and may include modifications and substitutions of the present invention. 基于LED的装置通常使用在约460nm下的GaN基蓝光LED发射器以及在约560nm下的发射黄光的Ce/YAG磷光剂。  LED-based devices generally at about 460nm used in a GaN-based blue LED emitters and the phosphors emit yellow light at approximately 560nm Ce / YAG. 图1是色度图表，其显示与眼睛响应卷积的各种颜色点。 FIG 1 is a chromaticity diagram showing a color point convolution with various eye response. 参考图1，可知透射的蓝光和黄色荧光的组合通常可产生白色10。 Referring to FIG 1, it is understood the combination of blue and yellow transmission generally be a white phosphor 10. 这种组合的颜色的表征称作颜色点，并在与眼睛响应卷积的三基色(tri-stimulus)相图上显示为xy点。 Characterization of the color of a color point of such a combination is referred to, and displayed as points on the xy three primary colors (tri-stimulus) with the eye response convolution FIG. 在其中提供小于红色12,绿色14和蓝色16的纯色的情况下，通过改变各种颜色的相对强度，可形成在三角形18 之内任意地方的颜色。 Providing less than 12 in which the red, the green case 14 and the solid blue 16, by varying the relative intensity of each color, any color may be formed in place of the triangle 18. 只有460nm(蓝色)和560nm(绿色/黄色)两种波长时，颜色通常受限于连接该两点的线，因此可获得的颜色受到可观的限制。 Only of 460 nm (blue) and of 560 nm (green / yellow) two wavelengths, color is typically limited to line connecting the two points, and therefore subject to considerable color obtained restricted. 为了形成接近从白炽灯泡发射光的白光，例如，需要红光源。 To form the bubbles near the emitting light from incandescent white light, e.g., a red light source need. 因此，本发明的实施方式包括发射红光的磷光剂源来获得所需的白光发射10。 Thus, embodiments of the present invention comprises a source of red light emitting phosphor to obtain the desired white light emission 10. 然而，因为热稳定性和红色磷光剂与可用的高量子效率红色磷光剂材料的主体的反应性，包括发射红光的磷光剂带来挑战。  However, because the reactivity and the thermal stability of the body and red phosphors high quantum efficiency of a red phosphor material available, including red-emitting phosphor challenge. 一些实施方式通常涉及形成与LED照明结构和电致发光装置兼容的发射红光的磷光剂。 Some embodiments relate generally to phosphors emitting red light is formed with the LED illumination structure and electroluminescent devices compatible. 形成这种发射红光的磷光剂的示例性方法如下所述，并可用于制备烧结的陶瓷，玻璃-陶瓷，硅酮/磷光剂掺混物和薄的玻璃/磷光剂复合材料等。 An exemplary method of forming the red light emitting phosphor as described below, can be used for the preparation of sintered ceramic, glass - ceramic, silicone / phosphor blend and a thin glass / phosphor composite materials. 其它示例性方法还参见2013年03月28日提交的共同待审的美国专利申请号13/852， 048,其题目为"用于LED磷光剂的硼酸铋玻璃包封剂"，该文的全部内容通过引用纳入本文。 Other exemplary methods see also U.S. Patent Application No. co-pending March 28, 2013, filed 13/852, 048, which is entitled "phosphor for LED bismuth borate glass encapsulant", the entire text incorporated by reference herein. 本发明的示例性实施方式包括红色磷光剂，其可沉积到黄色磷光剂基材上，由此添加第三荧光颜色拓宽发射的光的颜色空间，这使得通过合适地混合蓝色、黄色和红色贡献来调节发射的颜色。  Exemplary embodiments of the present invention comprises a red phosphor, which may be a yellow phosphor deposited onto the substrate, thereby adding a third fluorescent colors to broaden the emitted light color space, which makes it by suitably mixing blue, yellow and red colors contribute to regulate the emission. 常规地，因为热稳定性和与红色磷光剂和/或量子点材料的主体材料的反应性，包括发射红光的磷光剂的源会带来挑战。 Conventionally, since the thermal stability and a red phosphor and / or reactive material, quantum dot material body, comprising a source emitting red phosphor will be a challenge. 应指出，在本文中术语主体和主体材料可互换使用，且这种使用不应限制本文所附权利要求的范围。 It should be noted, the terms body and body materials are used interchangeably herein, and such use is not to limit the scope of the claims appended hereto. 例如，这种常规方法可增加所得装置的降解问题，因为装置中的材料可与环境或主体进行化学反应，由此导致在高温下损失量子效率。 For example, such conventional methods may increase the problems of degradation resulting device, because the device material may chemically react with the body or the environment, thereby resulting in a loss in quantum efficiency at high temperatures. 因此，示例性红色磷光剂方法应是稳健的，并与用来形成下面的黄色磷光剂(YAG)基材的方法相兼容。 Thus, the exemplary method the red phosphors should be robust, and used to form the following yellow phosphor (YAG) compatible with a substrate material. 可使用具有主体的发射红光的磷光剂的源，其可在不基本上影响其量子效率的情况下作为涂层施加到包含黄色磷光剂的材料上。  The use of phosphors emitting red light source having a body which may be applied to a material comprising a yellow phosphor as a coating without substantially affecting its quantum efficiency. 可用的示例性红色磷光剂包括但不限于(5池&]\%)23丨〇4511，]\1以15丨州3 511，其中]\1是〇3,51或83,〇35 511，以及其它合适的红色磷光剂。 Exemplary useful red phosphor including but not limited to (5 pools &] \%) 23 Shu 〇4511,] \ 1 15 Shu state 3511, wherein] \ is 1 or 〇3,51 83, 〇35 511, and other suitable red phosphor. 根据各转换波长，示例性磷光剂还可包含氧化物磷光剂，硫化物磷光剂，氮化物磷光剂。 According to the wavelength conversion, the exemplary phosphor may further comprise an oxide phosphor, a sulfide phosphor, nitride phosphor. 例如，示例性磷光剂可包含基于i3-SiA10N:EU，Re的发射黄光的磷光剂，硅酸盐基发射绿光的磷光剂例如(Ba，Sr，Ca，Mg) 2Si〇4: Eu，Re，或硫化物基发射绿光的磷光剂例如(Ba，Sr，Ca， 1^)(6&^1，11〇2(5,56，1'6)4 311，1^，氮化物基发射红光的磷光剂例如（51〇&，8&，1^) 八151仏511，此（1$1$5)，或硫化物基发射红光的磷光剂例如（51〇&，8&，1^)(5,56，1'6) : 已11，1^，其中1^可为恥，？111，5111，113,〇7，!1〇311'111，¥13"1，81和1中的任一种。 For example, the exemplary phosphor may comprise, based i3-SiA10N: green-emitting phosphor, for example (Ba, Sr, Ca, Mg) 2Si〇4 the EU, the yellow light emitted Re phosphor, silicate-based: Eu, Re, a sulfide group or a green-emitting phosphor, for example (Ba, Sr, Ca, 1 ^) (6 & ^ 1,11〇2 (5,56,1'6) 311,1 ^ 4, the nitride-based emission red phosphors such as (& 51〇, & 8, 1 ^) eight Fo 151 511, this (1 $ 1 $ 5), or a sulfide-based phosphor emitting red light such as (& 51〇, & 8, 1 ^) ( ) 5,56,1'6: 1〇311'111, ¥ 13 "in any of 1,81 and have been 11,1 ^ 1, where 1 ^ be ashamed, 111,5111,113, 〇7,?! one kind. 用于红色磷光剂材料的示例性主体可包含倍半硅氧烷主体。  Exemplary body for a red phosphor material may comprise a silsesquioxane body. 倍半硅氧烷或硅氧烷是具有通式RSi03/2的材料，其中R表示通过Si-C键连接到氧化硅的有机基团（或H)。 Silsesquioxane or siloxane is a material having the formula RSi03 / 2, wherein R represents a connection to the silicon oxide by a Si-C bond organic group (or H). 存在无数种倍半硅氧烷主体结构，包括但不限于无规结构22,梯型结构24,笼型结构26a，26b，26c 和部分笼型结构28,如图2A-2F所示。 There are countless silsesquioxane body structures including, but 22, 24 a ladder structure, a cage structure 26a, 26b, 26c is not limited to the portion of the cage structure and the random structure 28, as shown in Figure 2A-2F. 在一些实施方式中，倍半硅氧烷主体也可具有额外的硅酸盐官能团。 In some embodiments, the silsesquioxane body silicates may also have additional functional groups. [0041 ] 可以1-10重量％的范围，将红色磷光剂材料添加到示例性硅酸盐-甲基硅氧烷聚合物来形成浆料。 Range  may be 1-10% by weight of a red phosphor material added to the exemplary silicate - methyl siloxane polymer to form a slurry. 在一些实施方式中，红色磷光剂的加载量或浓度可为约1重量％-约30重量％，例如，1，2，5，10，15，20或30%。 In some embodiments, the amount or concentration of red phosphor loading agent may be from about 1 wt% - about 30 wt%, e.g., 30% or 1,2,5,10,15,20. 硅酸盐-甲基硅氧烷聚合物通常是硅酸盐-倍半硅氧烷的预聚合的形式，因此可施加到基材上并进行固化来形成硅酸盐-倍半硅氧烷，其中倍半硅氧烷可具有图2A-2F中所示的结构。 Silicate - methyl siloxane polymers are generally silicate - silsesquioxane prepolymerized form and therefore can be applied to a substrate and cured to form a silicate - silsesquioxane, wherein the silsesquioxane may have the structure shown in FIGS. 2A-2F. 例如，在一些实施方式中，甲基硅氧烷固化时形成梯型倍半硅氧烷。 For example, in some embodiments, the dimethicone is formed when cured ladder-type silsesquioxane. 此外，在预聚物阶段，可将示例性红色磷光剂材料添加到示例性硅酸盐-甲基硅氧烷聚合物。 Further, in the prepolymer phase, may be added to the exemplary red phosphor material of the exemplary silicate - methyl siloxane polymer. 图3显示根据本发明的一些实施方式的示例性固化过程。  FIG. 3 shows an exemplary curing process according to some embodiments of the present invention. 参考图3,示例性硅酸盐-甲基硅氧烷聚合物可包含第一非限制性结构30,其具有可在较高温度下进行缩合的多个硅醇（Si-ΟΗ)。 Referring to Figure 3, an exemplary silicate - methyl siloxane polymer may comprise a first non-limiting structure 30 having a plurality of silanol (Si-ΟΗ) can be condensed at higher temperatures. 当聚合物在例如约240°C_300°C下固化时，得到部分缩合的结构32。 When the polymer is cured, for example at about 240 ° C_300 ° C, partially condensed structure 32. 然后，聚合物可在约425°C下在N 2中达到缩合的结构34,其中Si-R基团仍然存在于缩合的网络中。 Then, the polymer structure 34 can be achieved in condensed N 2 at about 425 ° C, where Si-R groups still present in the condensate network. 在另一种实施方式中，当固化在空气中进行时，一些Si-R基团可转化成硅醇。 In another embodiment, when curing is performed in air, some of the Si-R group may be converted to a silanol. 例如，为了将Si-R 基团转化成Si-ΟΗ，可在较高的温度例如高于425°C下于空气中固化聚合物材料，或者可用氧等离子体进行处理，这构建另一缩合的结构36,由此进行甲基的部分氧化。 For example, to Si-R groups into Si-ΟΗ, such as above may be cured at 425 ° C in air polymer material, or may be an oxygen plasma treatment at higher temperatures, which construct further condensation structure 36, whereby the partial oxidation of the methyl group. 在该实施例中，甲基的完全氧化可在约600°C下进行。 , Complete oxidation of methyl group can be carried out at about 600 ° C in this embodiment. 可例如通过旋涂、喷涂、浸涂、丝网印刷或另一种合适的沉积方法将硅酸盐-倍半硅氧烷沉积到具有黄色磷光剂材料的基材上，该另一种合适的沉积方法能控制硅酸盐-倍半硅氧烷层的厚度、与下面的基材相兼容并能进行固化来获得如所需的缩合的结构。  for example by spin coating, spray coating, dip coating, screen printing or another suitable deposition method silicate - silsesquioxane deposited onto the substrate having a yellow phosphor material, the other suitable species can be controlled silicate deposition method - silsesquioxane layer thickness, is compatible with the underlying substrate and can be cured to obtain a desired structure such as a condensed. 如本文所述的示例性涂层可提供具有小于约50mJ/m2的低表面能涂层。  As used herein, the exemplary coating can be provided with a coating of less than about 50mJ / m2 low surface. 在一些实施方式中，沉积的涂层的低表面能可小于40mJ/m 2和甚至小于30mJ/m2。 In some embodiments, the coating is deposited a low surface energy can be less than 40mJ / m 2, and even less than 30mJ / m2. 一种实施方式提供约34mJ/m2的低表面能涂层。 One embodiment provides a low surface about 34mJ / m2 of energy coating. 在另一种实施方式中，在进行固化之前，可在沉积的红色磷光剂涂层之上提供不含任何磷光剂材料的硅酸盐或硅酸盐-倍半硅氧烷涂层来形成封盖层。 In another embodiment, prior to curing, it may be provided without any phosphor material on silicate or silicate red phosphor coating deposited - silsesquioxane coating formed seal caprock. 图4A-4C提供由如上所述的方法形成的包含红色磷光剂材料的示例性涂层的图形化显示。  Figures 4A-4C provide exemplary coating comprises a red phosphor material formed by the process described above graphical display. 参考图4A,显示具有460nmLED激发源的示例性焚光，其具有在倍半硅氧烷主体中的约10重量％的红色Eu-氮化物磷光剂的加载量，且在空气中于430 °C下加热1小时。 Referring to FIG. 4A, exemplary 460nmLED burning light having an excitation source, which loading Eu- red nitride phosphor agent having about 10% by weight of the silsesquioxane in the main body, and at 430 ° C in air 1 hour under heating. 参考图4B，显示具有约460nmLED激发源的示例性荧光，其具有在倍半硅氧烷主体中的10重量％加载量的红色(SrCaMg) S i 〇4: Eu磷光剂。 Referring to FIG. 4B, the phosphor having about 460nmLED exemplary excitation source, which has a% silsesquioxane body 10 wt loading of red (SrCaMg) S i 〇4: Eu phosphor. 形成浆料，旋涂到约1 -4μπι的厚度，并随后在空气中于430 °C下加热1小时。 Forming a slurry, spin-coated to a thickness of about 1 -4μπι, and then heated in air at 430 ° C 1 hour. 参考图4C，显示具有约460nmLED激发源的示例性荧光，其具有在倍半硅氧烷主体中的约10重量％的红色CaS: Eu磷光剂的加载量，且在空气中于约430 °C下加热1小时。 Referring to Figure 4C, an exemplary display about 460nmLED fluorescence excitation source, which has a main body silsesquioxane about 10% by weight of red CaS: Eu phosphor loading agent, and at about 430 ° C in air 1 hour under heating. 如图所示，在图4A-4C中所示的样品各自呈现在所需的颜色点的荧光。 As shown, the samples shown in Figures 4A-4C are each present in a desired color point of the phosphor. 虽然本文所述的实施例参考倍半硅氧烷主体，但可使用各种主体材料。  Although the embodiments described herein with reference silsesquioxane body, but various subject materials. 例如，另一种示例性主体可为但不限于碱性/氧化硅水玻璃。 For example, another exemplary body can be, but are not limited to alkali / silica waterglass. 该碱性/氧化硅水玻璃主体可包含例如， 比例为1 -20的Si 02/R20的7-8重量％硅酸盐水溶液，且R表示碱金属。 The alkali / silica body may comprise, for example, waterglass, a ratio of Si 7-8% by weight of silicate solution 1-20 02 / R20, and R represents an alkali metal. 当然，可替代地使用其它硅酸盐水溶液，例如，8-20重量％，20-30重量％，和大于30重量％。 Of course, other silicates may alternatively be used an aqueous solution, e.g., 8-20 wt%, 20-30 wt%, and greater than 30 wt%. 图5提供由如上所述的方法形成的包含红色磷光剂材料的示例性涂层的图形化显示。 Exemplary patterned coating comprises a red phosphor material as described above in FIG. 5 provides a method of forming a display. 参考图5,显示具有约460nmLED激发源的示例性荧光，其具有在碱性/氧化硅水玻璃主体中的约10重量％的红色Eu-氮化物磷光剂的加载量，且在空气中于约430 °C下加热1小时。 Referring to FIG 5, an exemplary display about 460nmLED fluorescence excitation source, which has a loading of about 10 wt% Eu- red nitride phosphor alkaline agent is silicon / oxide in the water glass body, and in the air at about heated at 430 ° C 1 hour. 如图所示，图5中的样品在适当的颜色点呈现荧光。 As shown, the sample is presented in FIG. 5 in an appropriate fluorescence color point. 又一种示例性主体可为但不限于溶胶-凝胶。  The body may be yet another exemplary but not limited to sol - gel. 示例性溶胶-凝胶主体可使用正硅酸四乙酯、水、酸和醇的混合物来制备。 Exemplary sol - gel body may be prepared using a mixture of tetraethyl orthosilicate, water, acid and alcohol. 当然，可类似地使用其它溶胶-凝胶。 Of course, other similarly sol - gel. 在一些实施方式中，可将醇盐溶解于醇中，并通过在酸性、中性或碱性条件下添加水来水解。 In some embodiments, the alkoxide can be dissolved in alcohol, and by adding water under acidic, neutral or basic hydrolysis conditions. 水解可用羟基替换醇盐配体，然后进行涉及羟基的缩合反应，从而形成包含Si-0-Si的聚合物。 Alternatively alkoxide hydrolysis available hydroxyl ligands, followed by condensation reactions involving a hydroxy group, to form a polymer containing the Si-0-Si. 可使用该示例性反应通过聚合以形成Si0 2的过程来构建更大的含硅的分子，且当进行高温热固化时完成该反应。 The exemplary reaction may be used to construct larger molecules by polymerization to form a silicon-containing process Si0 2, and the completion of the reaction when the high temperature heat curing. 例如，可以约10重量％的浓度，将例如(SrBaMg)2Si04:Eu，M(AlSi)N 3:Ei^*M 是Ca，Sr，或Ba，CaS: Eu的红色磷光剂材料以及其它合适的红色磷光剂加载进入主体基质。 For example, a concentration of about 10% by weight, for example, (SrBaMg) 2Si04: Eu, M (AlSi) N 3: Ei ^ * M is Ca, Sr, or Ba, CaS: a red phosphor material, Eu and other suitable a red phosphor matrix is ​​loaded into the body. 然后，可将该浆料例如旋涂、喷涂、浸涂、丝网印刷或以其它方式沉积到具有黄色磷光剂材料的下面的基材上，并达到约lwn的厚度。 Then, the slurry may be, for example, spin coating, spray coating, dip coating, screen printing or otherwise deposited onto an underlying substrate having a yellow phosphor material, and a thickness of about lwn. 在一些实施方式中，可将例如(SrBaMg)2Si04:Eu, M(AlSi )N3: Eu其中Μ是Ca，Sr，或Ba，CaS: Eu的红色磷光剂粉末以及其它合适的红色磷光剂添加到示例性硅酸盐水溶液，由此形成浆料。 In some embodiments, may be, for example, (SrBaMg) 2Si04: Eu, M (AlSi) N3: Eu wherein Μ is Ca, Sr, or Ba, CaS: a red phosphor powder Eu and other suitable red phosphor is added to exemplary aqueous silicate solution, thereby forming a slurry. 然后，可将该浆料例如旋涂、喷涂、浸涂、丝网印刷或以其它方式沉积到具有黄色磷光剂材料的下面的基材上，并达到约Ιμπι的厚度。 Then, the slurry may be, for example, spin coating, spray coating, dip coating, screen printing or otherwise deposited onto an underlying substrate having a yellow phosphor material, and a thickness of about Ιμπι. 在另一种实施方式中，可在沉积的红色磷光剂涂层之上提供硅酸盐涂层来形成封盖层，并随后在空气中于约430°C下加热1小时来完成该热处理。 In another embodiment, the silicate coating may be provided over the red phosphor coating deposited to form a capping layer, and then heated in air at about 430 ° C 1 hours to complete the heat treatment. 在另一种实施方式中，可在沉积的红色磷光剂涂层之上提供预聚合的溶胶-凝胶混合物来形成封盖层，并随后在空气中于约430°C 下加热1小时来完成该热处理。 In another embodiment, the prepolymerized sol may be provided over the red phosphor coating deposited - gel mixture to form a capping layer, and then heated in air at about 430 ° C 1 hours to complete this heat treatment. 图6提供如上所述形成的包含红色磷光剂材料的示例性涂层的图形化显示。 Exemplary patterned coating comprises a red phosphor material 6 provides a display formed as described above. 参考图6,显示具有约460nmLED激发源的示例性荧光，其具有在溶胶-凝胶衍生的主体中的约10重量％的红色Eu-氮化物磷光剂的加载量，且在空气中于约410 °C -430 °C 下加热1小时。 Referring to Figure 6, shows an exemplary fluorescence excitation source having about 460nmLED, with the sol - loading of about 10 wt% of a nitride red phosphor Eu- gel-derived body, and in the air at about 410 heating ° C -430 ° C 1 hour. 如图所示，图6中的样品在所需的颜色点呈现荧光。 As shown, in FIG. 6 presents a sample fluorescence in a desired color point. 图7显示本发明的一实施方式和下面的黄色磷光剂基材的比较。  Figure 7 shows a comparative embodiment and the following embodiment of the present invention, a yellow phosphor substrate. 参考图7,将具有倍半硅氧烷主体的红色CaS:Eu磷光剂旋涂到丝网印刷的黄色磷光剂玻璃靶70上，并与没有这种涂层72的黄色磷光剂(为玻璃料形式的Ce/YAG)玻璃靶进行比较。 CaS red 7, the body having a silsesquioxane: Eu phosphor screen printing, spin-coated onto glass yellow phosphor target 70, and with no such coating yellow phosphor 72 (the glass frit in the form of Ce / YAG) glass target compared. 图8显示本发明的另一实施方式。 Figure 8 shows another embodiment of the present invention. 参考图8,将红色CaS:Eu磷光剂涂覆到在玻璃(玻璃料形式的Ce/YAG)基材中的下面的黄色磷光剂上。 Referring to Figure 8, the red CaS: Eu phosphor coated onto the glass (in the form of glass frit Ce / YAG) in the substrate below the yellow phosphor. 显示具有约460nmLED激发源的示例性荧光，其在所需的发射带产生暖色调的白光。 Exemplary fluorescent display having about 460nmLED excitation source, which produces warm white light in the desired emission band. 至于量子点，这些材料是直径小于或等于10nm的发光主体，并呈现量子限制效应。  As quantum dots, these materials are less than or equal to the diameter of the light emitting body 10nm, and exhibit quantum confinement effects. 量子点以较窄的波长产生比典型的磷光剂更强的光。 Produce a stronger than the typical quantum dot phosphors light of a narrower wavelength. 当激发的电子从导带移动到价带时， 形成量子点的发射。 When the excited electrons move to the valence band from the conduction, the emission of the quantum dots are formed. 随着量子点的尺寸变小，发射具有更短波长的光。 With the small size of the quantum dots, emitting light having a shorter wavelength. 因此，在一些实施方式中，可通过调节量子点的尺寸，来获得具有所需的波长范围的光。 Thus, in some embodiments, by adjusting the size of the quantum dots to obtain light having a desired wavelength range. 示例性量子点可为半导体纳米晶体例如但不限于Si纳米晶体、ΙΙ-νΐ族化合物半导体纳米晶体、mv族化合物半导体纳米晶体，或IV-VI族化合物半导体纳米晶体。 Exemplary quantum dot is a semiconductor nanocrystal may be, for example, but not limited to Si nanocrystals, ΙΙ-νΐ compound semiconductor nanocrystals, mv compound semiconductor nanocrystals, or group IV-VI compound semiconductor nanocrystals. 在该实施方式中，量子点可单独地使用或以其混合物的形式来使用。 In this embodiment, the quantum dots may be used alone or as a mixture thereof is used. 该II-VI族化合物半导体纳米晶体包括但不限于CdS，CdSe， CdTe,ZnS,ZnSe,ZnTe,HgS,HgSe,HgTe,CdSeS,CdSeTe,CdSTe,ZnSeS,ZnSeTe,ZnSTe,HgSeS, HgSeTe，HgSTe，CdZnS，CdZnSe，CdZnTe，CdHgS，CdHgSe，CdHgTe，HgZnS，HgZnSe，HgZnTe， CdZnSeS，CdZnSeTe，CdZnSTe，CdHgSeS，CdHgSeTe，CdHgSTe，HgZnSeS，HgZnSeTe，或HgZnSTe。 The Group II-VI compound semiconductor nanocrystals, including but not limited to, CdS, CdSe, CdTe, ZnS, ZnSe, ZnTe, HgS, HgSe, HgTe, CdSeS, CdSeTe, CdSTe, ZnSeS, ZnSeTe, ZnSTe, HgSeS, HgSeTe, HgSTe, CdZnS , CdZnSe, CdZnTe, CdHgS, CdHgSe, CdHgTe, HgZnS, HgZnSe, HgZnTe, CdZnSeS, CdZnSeTe, CdZnSTe, CdHgSeS, CdHgSeTe, CdHgSTe, HgZnSeS, HgZnSeTe, or HgZnSTe. 此外，III-V族化合物半导体纳米晶体包括但不限于GaN，GaP，GaAs，A1N，A1P，A1As，InN， InP，InAs，GaNP，GaNAa，GaPAs，A1NP，AlNAs，AlPAs，InNP，InNAs，InPAs，GaAlP，GaAlNAs， GaAlPAs，GaInNP，GaInAs，GaInPAs，InAlNP，InAlNAs，或InAlPAs。 Further, III-V compound semiconductor nanocrystals, including but not limited to, GaN, GaP, GaAs, A1N, A1P, A1As, InN, InP, InAs, GaNP, GaNAa, GaPAs, A1NP, AlNAs, AlPAs, InNP, InNAs, InPAs, GaAlP, GaAlNAs, GaAlPAs, GaInNP, GaInAs, GaInPAs, InAlNP, InAlNAs, or InAlPAs. 此外，IV-VI族化合物半导体纳米晶体可包括但不限于SbTe。 Furthermore, IV-VI compound semiconductor nanocrystals can include, but are not limited to SbTe. 图11显不在表面贴装封装中的白光LED。  FIG. 11 is not substantially surface-mount white LED package. 参考图11，在一些实施方式中，可将一种或多种磷光剂或量子点与玻璃材料或玻璃料材料(例如，用来包封下面的装置、层或材料的材料)来形成磷光剂-玻璃或量子点混合物。 Referring to Figure 11, in some embodiments, may be one or more phosphor material or quantum dots or a glass frit material (e.g., to encapsulate the following means, the material layer or material) to form a phosphor - a mixture of a glass or a quantum dot. 然后，可在容器之内，将该混合物施加到LED110 例如GaN或InGaN LED。 Then, the containers may be, for example, applying the mixture to LED110 GaN or InGaN LED. 图11显示用于示例性LED的在主体材料116 (例如，硅酮或其它合适的主体材料）中的LED110、丝焊112、磷光剂颗粒114,其环绕磷光剂和/或量子点颗粒114、基材118和封装件120。 Figure 11 shows an exemplary LED of the body material 116 (e.g., silicone or other suitable host material) of the LED 110, wire bonding 112, the phosphor particles 114, which surrounds the phosphor and / or a quantum dot particles 114, substrate 118 and the package 120. 封装件120包含基材118、环氧树脂透镜124,和由塑料或陶瓷制成的容器或杯子122，以包含磷光剂或量子点混合物，保护LED110，和反射来自封装件的光。 Package 120 comprises a substrate 118, an epoxy resin lens 124, and the container or cup made of plastic or ceramic 122 to contain a mixture of phosphor or quantum dots, protection LED 110, and the reflected light from the package. 在一些实施方式中，红色磷光剂材料可进行混合并施加到下面的主体材料116和磷光剂颗粒114设置上，并如上所述进行固化来形成包含红色磷光剂材料的层126。 In some embodiments, the red phosphor material may be mixed and applied to the underlying material 116 and phosphor particles 114 and the main body, and cured as described above to form a layer 126 containing a red phosphor material. 在另一种实施方式中，还可邻近包含红色磷光剂材料的层126施加封盖层(未显示）。 In another embodiment, the layer may also comprise a red phosphor adjacent the material 126 is applied to the capping layer (not shown). 图12显示在表面贴装封装中的另一种白光LED。  FIG. 12 shows another surface-mount white LED package. 参考图12,磷光剂和/或量子点114 已经与玻璃或主体材料116混合，以形成磷光剂-玻璃或量子点混合物，其进行烧制来构建具有嵌入其中的磷光剂/量子点的玻璃板121。 Referring to Figure 12, phosphor, and / or quantum dots 114 and the glass 116 has a host material or mixing, to form a phosphor - glass, or a mixture of the quantum dot, which is fired to construct a glass sheet having embedded therein a phosphorescent agent / quantum dots 121. 封装件120包含LED110、丝焊112和封装件基材118以及由塑料或陶瓷材料制成的容器或杯子122。 Package 120 comprises LED 110, wire bonds 112 and 118 and a container 122 made of glass or plastic or ceramic material package substrate. 可通过丝网印刷、喷涂、旋涂等将包含磷光剂和/或量子点的玻璃混合物114,116施加到基材，然后进行烧制来制备覆盖在基材118和封装件上的致密玻璃层。 The mixture of glass by screen printing, spray coating, spin coating comprising a phosphor and / or quantum dots 114 is applied to a substrate, followed by baking to prepare the cover glass substrate 118 and the dense layer on the package. 因为烧制的包含磷光剂的混合物是玻璃，可无需覆盖透镜。 Because the mixture of phosphor containing glass is fired, the lens may need to override. 可混合红色磷光剂材料，施加到玻璃板121 (即，包含磷光剂的玻璃混合物114，116)上，并如上所述进行固化来形成包含红色磷光剂材料的层126。 Mixing a red phosphor material may be applied to the glass plate 121 (i.e., a glass containing a mixture of phosphor 114, 116) on, and cured as described above to form a layer 126 containing a red phosphor material. 在另一种实施方式中，还可邻近包含红色磷光剂材料的层126施加封盖层(未显示）。 In another embodiment, the layer may also comprise a red phosphor adjacent the material 126 is applied to the capping layer (not shown). 图13A显示具有根据本发明的一些实施方式的波长转换板的发光装置。  FIG 13A shows a light emitting device having a wavelength conversion panel some embodiments of the present invention. 参考图13A，显示具有示例性波长转换板132的发光装置130,其具有用一个或多个包含红色磷光剂或量子点材料的层涂覆的下面的YAG基材，该材料如上所述进行混合、施加和固化。 13A, the light-emitting display device 132 an exemplary wavelength conversion panel having 130 or more having with a red phosphor comprising the following layers or quantum dot material coated with a YAG substrate, the material described above were mixed , application and curing. 还可邻近一个或多个包含红色磷光剂或量子点的材料的层施加封盖层(未显示）。 Layer may also comprise one or more adjacent to a red phosphor material or quantum dots applied to the cover layer (not shown). 当在板132的波长转换层中包含量子点或磷光剂时，将入射激发光转换成产生波长-转换的光(反射的或以其它形式的光）。 When the quantum dots or phosphors contained in the wavelength conversion layer plate 132, the excitation light is converted into a wavelength - light (reflected light or other forms) conversion. 虽然没有显示，但波长转换板132还可包含介电层、纳米图案和金属层。 Although not shown, the wavelength converting plate 132 may further comprise a dielectric layer, a nano-pattern and a metal layer. 发光装置130包含由框架134支撑并具有电极139的发光元件133,该电极139在框架134上形成并通过电线140或其它合适的装置电气连接到发光元件133。 The light emitting device 134 is supported by a frame 130 comprising a light-emitting element electrodes 139 and 133, the electrode 139 is formed on the frame 134 and connected to the light emitting element 133 through a wire 140 or other suitable electrical devices. 发光元件133可通过合适的材料135来包封。 135 light emitting element 133 can be encapsulated by a suitable material. 在所示的实施方式中，所示的波长转换板132以反射设置的形式来设置，由此将光转换进入装置130的反射部分137。 In the illustrated embodiment, the wavelength converting plate 132 shown in the form of reflection arranged to set, thereby converting the light reflecting means 130 enters the portion 137. 波长转换板132还可位于发光装置130上方和/或包括发光装置130,如图13B所示。 Wavelength converting plate 132 may also be located above the light emitting device 130, and / or comprising a light emitting device 130, shown in Figure 13B. 发光元件133可为LED、激光二极管等(例如，发射420-480nm 的蓝色光的GaN基LED)。 The light emitting element 133 may be an LED, laser diode (e.g., the 420-480nm blue light emitting GaN-based LED). 示例性包封材料可为但不限于环氧树脂、硅、基于丙烯酰基的聚合物、玻璃、碳酸酯基聚合物，或其混合物。 Exemplary encapsulating material can be, but is not limited to epoxy, silicone, acryl-based polymers, glass, carbonate-based polymers, or mixtures thereof. 在各种实施方式中，包含Bi的硼酸盐玻璃可用作用于下面的YAG基材的包封材料。  In various embodiments, the borate glass comprises Bi may be used as encapsulating material below YAG substrate. 在一种情况中，粉末状玻璃和磷光剂(或多种不同磷光剂粉末)的混合物可与合适的有机粘合剂(例如，松油醇、乙基纤维素等）、分散剂、表面活性剂和/或溶剂掺混。 In one case, a mixture of the powdered glass and a phosphor (or a plurality of different phosphors powder) with a suitable organic binder (e.g., terpineol, ethyl cellulose, etc. ), dispersing agents, surface active agent and / or solvent blend. 可将在这种情况下为玻璃料糊料或混合物的该包封材料沉积到薄的玻璃基材上。 In this case, can be deposited onto the substrate is a thin glass frit paste or encapsulating material mixture. 基材的示例包括但不限于通过熔合法或其它合适的方法制造的高Na含量的铝硅酸盐玻璃。 Example substrates include, but are not limited to a high Na content is produced by a fusion process or other suitable method aluminosilicate glass. 然后可在约350°C下对基材/玻璃料组件进行烧制，从而烧掉糊料的有机组分，然后加热至约500-550°C，将玻璃料烧结至足够透明的状态。 It may then be fired to the substrate / glass frit components at about 350 ° C, thereby burning the organic components of the paste, and then heated to about 500-550 ° C, the glass frit to sufficiently transparent state. 第一温度通常驱除有机载剂，并可通过例如有机载剂的沸点或使用蒸气压数据来确定，并可在常压或真空下实施。 The first temperature is generally repellent organic vehicle, and may be determined by the boiling point of the organic carrier, for example, or using a vapor pressure data, and carried out at atmospheric pressure or under vacuum. 用来将磷光剂/玻璃料玻璃混合物固化或烧制成致密玻璃的第二更高的温度可通过玻璃料材料来确定，前提是待施加磷光剂/玻璃料玻璃混合物的基材的软化温度应比磷光剂/玻璃料玻璃混合物的固化或烧制温度更高约100°C。 The softening temperature for the phosphor / glass frit mixture is cured or fired into a dense second glass higher temperatures may be determined by the frit material, provided that the agent be applied phosphor / glass frit mixture of the substrate to be about 100 ° C higher than the firing temperature or curing agent phosphor / glass frit mixture. 在一些实施方式中，可以在烧结前，从玻璃组合物完全或者基本上去除粘合剂。 In some embodiments, the can before sintering, the glass composition is completely or substantially remove the binder. 这样，进行粘合剂烧掉的温度可以低于烧结温度。 Temperature In this way, the adhesive may be burned below the sintering temperature. 在其它实施方式中，在烧结的玻璃中的磷光剂的加载量可为约1重量％-约30重量％，例如，1，2,5，10，15,20或30%。 In other embodiments, the loading of the phosphor in the sintered glass may be from about 1 wt% - about 30 wt%, e.g., 30% or 1,2,5,10,15,20. 为了避免別的下降，可以在富集〇2的气氛中而不是在空气中进行烧结。 To prevent other drops, it can not be sintered in an atmosphere of air enriched in 〇2. 在另一种实施方式中，可通过在共同待审的美国专利申请号13/852,048中所述的流延饶铸过程来制备自立式(free-standing)玻璃料/磷光剂膜，该文的全部内容通过引用纳入本文。  In another embodiment, by casting in the casting process Rao co-pending U.S. Patent Application No. 13 / 852,048 to prepare standing (free-standing) glass frit / phosphor film, the entire content of which is incorporated herein by reference. 在一些实施方式中，磷光剂可包含粒度为ll〇nm的量子点。 In some embodiments, the phosphor may comprise ll〇nm particle size of quantum dots. 该磷光剂/玻璃料玻璃混合物可施加作为LED装置的活性平面之上或附近的层。 The phosphor / glass frit mixture above the plane of the LED device is active at or near the layer can be applied. 在磷光剂/玻璃料玻璃混合物中的磷光剂粉末的量可变化到所需的量。 An amount of phosphor powder in the phosphor / glass frit mixture may be varied to a desired amount. 可以通过多次沉淀磷光剂/玻璃料玻璃混合物来增加固结的含磷光剂玻璃料层的最终厚度。 Can / glass frit mixture to increase the final thickness of the phosphor-containing agent consolidated frit layer by multiple precipitation phosphor. 在各个实施方式中，磷光剂粉末可以在整个玻璃中均勾分布。 In various embodiments, the phosphor powder may be distributed throughout all the glass hook. 在其他实施方式中，磷光剂粉末可以在玻璃内局部分布，即局部分布在玻璃层的一个或两个自由表面处。 In other embodiments, the phosphor powder may be locally distributed in the glass, i.e., a local distribution in the glass layer or both surfaces of freedom. 磷光剂-玻璃料玻璃混合物的一种示例性组合物包含玻璃和至少一种磷光剂，该玻璃包含Bi203和至少30摩尔％B 2〇3，其可用于其中该层是烧制的包含Bi203和B2〇3的玻璃料和至少一种磷光剂的混合物的应用，且其中该层不含Pb。  The phosphor - a mixture of glass frit exemplary composition comprises at least one of glass and the phosphor, the glass comprises at least 30 mole Bi203 2〇3% B, which can be used wherein the layer is fired and glass frit comprising Bi203 B2〇3 and at least one application of a mixture of phosphors, and wherein the layer is free of Pb. 另一种实施方式包含玻璃组合物， 该玻璃组合物以摩尔百分比计包含10-30 %Bi2〇3,大于0%Na20,15-50 %ZnO、ZnF2或其组合，30-55 %B2〇3，0-3 % Si02，0-1 % W〇3，0-12 % BaO，CaO，SrO，或其组合。 Another embodiment comprises a glass composition, the glass composition comprising 10-30 mole percent Bi2〇3%, greater than 0% Na20,15-50% ZnO, ZnF2 or a combination thereof, 30-55% B2〇3 , 0-3% Si02,0-1% W〇3,0-12% BaO, CaO, SrO, or a combination thereof. 有些玻璃组合物可包含至少l%Na20,并可包含15-50%Zn0。 Some of the glass compositions may comprise at least l% Na20, and containing 15-50% Zn0. 在其它实施方式中，玻璃组合物以摩尔百分比计包含12-20%Bi2〇3,5-12%Na2〇,2〇-30%ZnO,38-52%B2〇3,〇-3%Si〇2,〇-l%W〇3,卜12% BaO，CaO，SrO，或其组合。 In other embodiments, the glass composition comprising 12-20 mole percent Bi2〇3,5-12% Na2〇, 2〇-30% ZnO, 38-52% B2〇3, square-3% Si〇 2, square-l% W〇3, Bu 12% BaO, CaO, SrO, or a combination thereof. 在一些实施方式中，玻璃组合物包含14-16 %Bi2〇3，5-11 %Na20， 22-27 % ZnO，40-51 % B2O3，0-3 % Si〇2，0-1 % W〇3，1-11 % BaO，CaO，SrO，或其组合。 In some embodiments, the glass composition comprises 14-16% Bi2〇3,5-11% Na20, 22-27% ZnO, 40-51% B2O3,0-3% Si〇2,0-1% W〇 3,1-11% BaO, CaO, SrO, or a combination thereof. 在其它实施方式中，玻璃组合物以摩尔百分比计可包含10-30%Bi20 3,0-20%M20且其中Μ是Li，Na，K， Cs，或其组合，0-20 % R0且其中R是Mg，Ca，Sr，Ba，或其组合，15-50 % ZnO、ZnF2或其组合，〇-5%六12〇3,〇-5%?2〇5，和3〇-55%82〇3。 In other embodiments, the glass composition in mole percent may comprise 10-30% Bi20 3,0-20% M20 and wherein Μ is Li, Na, K, Cs, or a combination thereof, 0-20% R0 and wherein R is Mg, Ca, Sr, Ba, or a combination thereof, 15-50% ZnO, ZnF2 or a combination thereof, six-5% 12〇3 square, square-5%? 2〇5, and-55% 82 3〇 〇3. 其它示例性组合物如共同待审的美国专利申请号13/ 852，048所述，该文的全部内容通过引用纳入本文。 Other exemplary compositions as described in co-pending U.S. Patent Application No. 13 / 852,048, the entire content of which is incorporated herein by reference. 下面的黄色磷光剂(YAG)基材可包含玻璃基材。  Next, a yellow phosphor (YAG) substrate may comprise a glass substrate. 玻璃基材的厚度可小于或等于约5mm，例如是4mm，3mm，2mm，1mm，Ο · 5mm或更小。 The thickness of the glass substrate may be less than or equal to about 5mm, for example, 4mm, 3mm, 2mm, 1mm, Ο · 5mm or less. 玻璃基材可以是薄的烧性玻璃基材。 Thin glass substrate may be fired glass substrate. 在一些实施方式中，载体基材可包括条带或者基材，其中可以在制造该层之后去除玻璃层。 In some embodiments, the carrier substrate may comprise a strip or base, wherein the glass layer may be removed after the manufacture of the layer. 玻璃层可从载体去除，并随后在制造之后连接到另一个表面，并还独自进行烧制。 Glass layer may be removed from the carrier, and then connected to the other surface after manufacture, and further fired alone. 玻璃层的厚度可小于或等于约5mm例如是4mm，3mm, 2mm , 1 mm , 0.5mm, 0.4mm , 0.3mm, 0.2mm , 0.1 mm , 0.09mm, 0 · 08mm，0 · 07mm，0 · 06mm，或0 · 05mm或更小。 The thickness of the glass layer may be less than or equal to about 5mm, for example, 4mm, 3mm, 2mm, 1 mm, 0.5mm, 0.4mm, 0.3mm, 0.2mm, 0.1 mm, 0.09mm, 0 · 08mm, 0 · 07mm, 0 · 06mm or 0 · 05mm or less. 在一些实施方式中，玻璃层的厚度是约0 · 01mm-约lmm,例如是0.01mm-〇.2mm。 In some embodiments, the thickness of the glass layer is from about 0 · 01mm- about lmm, for example, a 0.01mm-〇.2mm. 基材上的玻璃层或者单独的玻璃层可用于在例如制造过程（如晶片尺寸工艺，例如6英寸X6英寸或者甚至更大)来制造LED灯。  glass layer or a separate glass layer on a substrate, for example, may be used in the manufacturing process (process wafer size, e.g., 6 inches or even larger X6 inch) produced an LED lamp. 可以在玻璃层上制造多个LED，并在制造之后分成单个的LED。 A plurality of LED may be fabricated on a glass layer, and is divided into individual LED after manufacture. 因此，具有与示例性红色磷光剂层组合的磷光剂/玻璃料玻璃层的装置比当将硅酮用作包封材料时具有更高的热稳定性，且磷光剂/玻璃料玻璃层具有更好的化学稳定性和环境稳定性。 Thus, in combination with phosphor means exemplary red phosphor layer / glass frit having a glass layer having a higher thermal stability than when silicone is used as the encapsulating material, and the phosphor / glass frit glass layer having a more good chemical stability and environmental stability. 应指出，在一些实施方式中，包含红色磷光剂材料的层将不包含陶瓷氧化物前体(例如，各种金属例如铝、钛、错、钽、银和/或钒的化合物以及各种非金属化合物例如硼或磷的化合物，其可溶解于溶液中并水解，后续地在较低温度下和较快的反应速率下热解，来形成陶瓷氧化物涂层）。  It should be noted that, in some embodiments, the layer comprising a red phosphor material will not contain ceramic oxide precursors (e.g., various metals such as aluminum, titanium, wrong, tantalum, silver and / or vanadium compounds and various non-metallic compounds such as boron or phosphorus compound which is soluble in the solution and hydrolysis, subsequently pyrolyzed at relatively low temperatures and at a faster reaction rates to form ceramic oxide coatings). 有些实施方式可包含填料，其包括但不限于处于各种形貌的各种无机填料和有机填料，包括但不限于粉末、颗粒、薄片、微气球等。  Some embodiments may include fillers, including but not limited to inorganic fillers in various organic fillers and a variety of morphologies, including but not limited to powders, particles, flakes, microballoons and the like. 无机填料的例子包括合成材料和天然材料，如各种金属和非金属的氧化物、氮化物、硼化物和碳化物，例如玻璃、氧化铝、二氧化硅、 二氧化钛、氧化锌、氧化妈和氧化舒，如钛酸钾和钛酸钡的钛酸盐，如银酸锂和银酸铅的银酸盐，硫酸钡、碳酸钙、沉淀硅藻土、硅酸铝或其他硅酸盐，颜料，磷光剂，金属如银、铝和铜， 娃灰石(¥〇11〇81：011；^6)、云母、高岭土、粘土、滑石等此外，还可使用一些有机材料例如纤维素、聚酰胺、酚类树脂等。 Examples of inorganic fillers include synthetic and natural materials, such as various metals and non-metal oxides, nitrides, borides and carbides, such as glass, alumina, silica, titania, zinc oxide, and oxide Ma Shu, such as potassium titanate and titanate, barium titanate, lithium and silver as silver salts of lead acid silver, barium sulfate, calcium carbonate, precipitated diatomaceous earth, aluminum silicate or other silicates, pigments, phosphor, metals such as silver, aluminum and copper, limestone baby (¥ 〇11〇81: 011; ^ 6), mica, kaolin, clay, talc, etc. Moreover, some organic material may be used such as cellulose, polyamides, phenolic resins and the like. 优选的填料包括磷光剂，例如但不限于硫化物、硒化物和硫硒化物如硫化锌和硫化镉、硫氧化物，氧主导的磷光剂如硼酸盐、铝酸盐、没食子酸盐、硅酸盐等， 以及卤化物磷光剂如碱金属卤化物、碱土金属卤化物和卤氧化物。 Preferred fillers include phosphorescent agents, such as, but not limited to, sulfide, selenide, and selenides such as zinc sulfide sulfur and sulfide, sulfur oxides, oxygen dominated phosphors such as borates, aluminates, gallates, silicon acid salt, and a halide phosphor as alkali metal halides, alkaline earth metal halides and oxyhalides. 示例性磷光剂化合物还可用包括但不限于锰、银、铜、卤化物等的活化剂进行掺杂。 Exemplary phosphorescent compounds may also be used include, but are not limited to, manganese, silver, copper, halide activator is doped. 合适的磷光剂可为根据转换波长的氧化物磷光剂、硫化物磷光剂和氮化物磷光剂。 Suitable phosphor can be oxide phosphor according to the wavelength conversion, a sulfide phosphor and a nitride phosphor. 例如，磷光剂可包含基于i3-SiA10N:Eu， Re的发射黄光的（例如，约570nm-约590nm)磷光剂，硅酸盐基发射绿光的（例如，约495nm-约570nm)磷光剂例如(Ba，Sr，Ca，Mg) 2Si〇4: Eu，Re，或硫化物基发射绿光的（例如，约495nm-约570nm)磷光剂例如(Ba，Sr，Ca，Mg) (Ga，Al，In)2(S，Se，Te)4: Eu，Re，氮化物基发射红光的（例如，约620nm_约740nm)磷光剂例如（Sr，Ca，Ba，Mg)AlSiNx:Eu，Re(l Sx$5)，或硫化物基发射红光的（例如，约620nm-约740nm)磷光剂例如（Sr，Ca，Ba，Mg) (S，Se，Te): Eu，Re其中Re可为Nd，Pm，Sm，Tb，Dy，Ho，Er，Tm，Yb，F，Cl，Br，和I中的任一种。 For example, based phosphor may comprise i3-SiA10N: Eu, Re emitting yellow light (e.g., from about 590 nm to about 570nm-) phosphor, silicate-based green-emitting (e.g., about from about 495nm- 570nm) phosphor e.g. (Ba, Sr, Ca, Mg) 2Si〇4: Eu, Re, sulfide-based, or green-emitting (e.g., about from about 495nm- 570nm), for example, phosphor (Ba, Sr, Ca, Mg) (Ga, al, in) 2 (S, Se, Te) 4: Eu, Re, a nitride-based red-emitting (e.g., from about 620nm_ about 740nm), for example, phosphor (Sr, Ca, Ba, Mg) AlSiNx: Eu, Re (l Sx $ 5), or a sulfide-based red-emitting (e.g., about from about 620nm- 740nm), for example, phosphor (Sr, Ca, Ba, Mg) (S, Se, Te): Eu, Re where Re may be as Nd, Pm, Sm, Tb, Dy, Ho, Er, Tm, Yb, F, Cl, Br, I, and any one of. 优选地红色磷光剂可为但不限于（5冲&]\%)25丨04 511，]\1以15丨）吣511其中]\1是〇3,51或83,〇35 511以及其它合适的红色磷光剂。 Preferably, the red phosphor can be, but are not limited to (5 red &] \%) 04 511 25 Shu,] \ 1 15 Shu) wherein Qin 511] \ is 1 or 〇3,51 83, 511, and other suitable 〇35 red phosphors. 取决于例如填料种类、所需的涂层厚度等的因素，上述磷光剂填料的粒度和形状可在宽范围中进行变化。 Depending on factors such as the type of filler, the desired coating thickness of the phosphor particle size and shape of the filler may vary over a wide range. 取决于例如在最终涂层中所需的特征，磷光剂填料的量也可在宽范围中变化。 For example, depending on the desired characteristics in the final coating, the amount of phosphor filler can also vary over a wide range. 涂层组合物中还可存在其它材料。  The coating composition may also be present other materials. 例如，可使用改性填料的表面用于更好的粘合性的材料，例如硅烷、缩水甘油氧基丙基二甲氧基硅烷、疏基丙基二甲氧基硅烷和乙烯基二乙酰氧基硅烷等。 For example, a surface-modified filler for better adhesion of material, such as silane, glycidoxypropyl silane, mercapto propyl dimethoxy silane and vinyl-diacetoxy silane and the like. 在一些实施方式中，还可将悬浮剂添加到涂层组合物。 In some embodiments, the suspending agents may also be added to the coating composition. 本发明的一些实施方式提供用于将输入波长转换成输出波长的波长转换板。 Some embodiments  The present invention provides for an input to the wavelength conversion of the wavelength conversion output wavelength plate. 波长转换板可包含第一磷光剂层和第二磷光剂层，该第一磷光剂层包含在整个第一基质中分布的第一磷光剂颗粒，且该第二磷光剂层包含在整个第二基质中分布的第二磷光剂颗粒。 A first wavelength converting plate may comprise a phosphor layer and second phosphor layer, the first layer comprises a first phosphor phosphor particles distributed throughout the first matrix and the second phosphor contained in the entire second layer a second phosphor distributed in the matrix particles. 在其它实施方式中，第一磷光剂颗粒是发射黄光的磷光剂颗粒，第二磷光剂颗粒是发射红光的磷光剂颗粒。 In other embodiments, the first yellow-emitting phosphor particles are phosphor particles, particles of the second phosphor is a red-emitting phosphor particles. 在另一种实施方式中，第二磷光剂层不包含陶瓷氧化物前体。 In another embodiment, the second phosphor layer does not comprise an oxide ceramic precursor thereof. 第二磷光剂层可与第一磷光剂层物理接触，且第二基质包含倍半硅氧烷主体材料、溶胶-凝胶主体材料或碱/硅酸盐水玻璃主体材料。 The second phosphor layer may be in contact with the first physical phosphor layer, and the second substrate main body comprises a silsesquioxane material sol - gel material body or base / silicate waterglass host material. 在各种实施方式中，输出波长可随下述的变化来确定:第二基质中第二磷光剂颗粒的加载量，第二磷光剂层的厚度，第一基质中第一磷光剂颗粒的加载量，第一磷光剂层的厚度，及其组合。 In various embodiments, the output wavelength can be determined with the following changes: loading a second matrix the second phosphor particles, thickness of the second phosphor layer, a first matrix of a first load of phosphor particles the amount, thickness of the first phosphor layer, and a combination thereof. 在一种实施方式中，波长板的复合材料厚度是约100-500微米。 In one embodiment, the composite thickness of the wavelength plate is approximately 100-500 microns. 示例性第二磷光剂颗粒包括但不限于粒，（31〇3,8&，]\%)(5,56，了6)511，1^颗粒，其中1^可为恥，？ Exemplary second phosphor particles include but are not limited to tablets, (31〇3,8 &,] \%) (5,56, 6) 511,1 ^ particles, which may be shame ^ 1,? 111，5111，1'13,〇7，!1〇311'111，¥13，？ 111,5111,1'13, 〇7,! 1〇311'111, ¥ 13 ,? ， Cl，Br，和I 中的任一种，（SrBaMg)2Si04:Eu颗粒，M(A1 Si )N3:Eu颗粒，其中Μ是Ca，Sr，或Ba， CaS:Eu颗粒，及其组合。 , Cl, Br, I, and any one of, (SrBaMg) 2Si04: Eu particles, M (A1 Si) N3: Eu particles, wherein Μ is Ca, Sr, or Ba, CaS: Eu particles, and combinations thereof. 示例性第一磷光剂颗粒包括但不限于铈掺杂的钇铝石榴石(YAG)， 和其它合适的黄色磷光剂。 Exemplary first phosphor particles include, but are not limited to cerium-doped yttrium aluminum garnet (YAG), and other suitable yellow phosphor. 在其它实施方式中，第一磷光剂层、第二磷光剂层或第一磷光剂层和第二磷光剂层包含量子点。 In other embodiments, the first phosphor layer and second phosphor layer or a phosphor layer and second phosphor layer comprises a quantum dot. 示例性量子点可包含II-VI族化合物半导体纳米晶体，III-V族化合物半导体纳米晶体，IV-VI族化合物半导体纳米晶体，或其组合。 Exemplary quantum dot may include group II-VI compound semiconductor nanocrystals, III-V compound semiconductor nanocrystals, IV-VI compound semiconductor nanocrystals, or a combination thereof. 在一些实施方式中，可将第二磷光剂层旋涂、喷涂、浸涂或丝网印刷到第一磷光剂层上。 In some embodiments, the second phosphor layer may be spin coating, spray coating, dip coating, or screen printed onto a first phosphor layer. 第二基质中第二磷光剂颗粒的示例性分布是约1%-约30重量％。 A second matrix the second exemplary distribution of phosphor particles is from about 1% - about 30 wt%. 在另一种实施方式中，波长转换板具有在第二磷光剂层上方的封盖层，其中封盖层基本上没有任何磷光剂颗粒。 In another embodiment, the wavelength conversion sheet having a cap layer over the second phosphor layer, wherein the capping layer is substantially free of any phosphor particles. 示例性第二磷光剂层可具有小于约50mJ/m 2的低表面能。 Exemplary second phosphor layer may have a low surface less than about 50mJ / m 2 of energy. 在一些实施方式中，沉积的层的低表面能可小于约40mJ/m2和甚至小于约30mJ/m 2。 In some embodiments, the deposited layer is a low surface energy can be less than about 40mJ / m2, and even less than about 30mJ / m 2. 优选的实施方式提供约34mJ/m2的低表面能涂层。 The preferred embodiment provides a low surface about 34mJ / m2 of energy coating. 本发明的其它实施方式包含照明装置，其具有至少一个发光二极管和多层结构， 该至少一个发光二极管适于发射峰值波长在可见光谱区中的基色光。  Other embodiments of the present invention comprises a lighting device having at least one light emitting diode and a multilayer structure, which is adapted to the at least one light emitting diode peak emission wavelength of primary light in the visible spectrum region. 该多层结构包含第一磷光剂层和第二磷光剂层，该第一磷光剂层包含在整个第一基质中分布的第一磷光剂颗粒，且该第二磷光剂层包含在整个第二基质中分布的第二磷光剂颗粒，由此第二磷光剂层与第一磷光剂层物理接触，且第二基质包含倍半硅氧烷主体材料、溶胶-凝胶主体材料或碱/硅酸盐水玻璃主体材料。 The multi-layer structure comprising a first phosphor layer and second phosphor layer, the first layer comprises a first phosphor phosphor particles distributed throughout the first matrix and the second phosphor contained in the entire second layer the second phosphor particle distribution in the matrix, whereby the second phosphor layer is in contact with the first physical phosphor layer, and the second substrate main body comprises a silsesquioxane material sol - gel body or base material / silica brine glass host material. 在一些实施方式中，第一磷光剂颗粒是发射黄光的磷光剂颗粒，第二磷光剂颗粒是发射红光的磷光剂颗粒。 In some embodiments, the first yellow-emitting phosphor particles are phosphor particles, particles of the second phosphor is a red-emitting phosphor particles. 在另一种实施方式中，第二磷光剂层不包含陶瓷氧化物前体。 In another embodiment, the second phosphor layer does not comprise an oxide ceramic precursor thereof. 在各种实施方式中，输出波长可确定为随下述因素变化的函数:第二基质中第二磷光剂颗粒的加载量，第二磷光剂层的厚度，第一基质中第一磷光剂颗粒的加载量， 第一磷光剂层的厚度，及其组合。 In various embodiments, the output may be determined as a function of wavelength with changes in such factors: loading a second matrix the second phosphor particles, thickness of the second phosphor layer, a first matrix of a first phosphor particles loading the thickness of the first phosphor layer, and a combination thereof. 示例性第二磷光剂颗粒包括但不限于（Sr，Ca，Ba，Mg) 八151心士11，1^(1$叉$5)颗粒，（51〇&，8&，]\^)(5,56，丁6)511，1^颗粒，其中1^可为恥，？ Exemplary second phosphor particles include, but eight persons heart 151 11,1 ^ ($ 1 $ 5 forks) are not limited to (Sr, Ca, Ba, Mg) particles (& 51〇, 8 &,] \ ^) (5, 56, D 6) 511,1 ^ particles, which may be shame ^ 1,? 111， 5111，113,〇7，!1〇311'111，¥13，卩，(：1，81和1中的任一种，（5池&]\%)25104 511颗粒，]\1(厶151)吣：已11 颗粒，其中Μ是Ca，Sr，或Ba，CaS: Eu颗粒，及其组合。示例性第一磷光剂颗粒包括但不限于铈掺杂的钇铝石榴石(Ce:YAG)，和其它合适的黄色磷光剂。在其它实施方式中，第一磷光剂层、第二磷光剂层或第一磷光剂层和第二磷光剂层包含量子点。示例性量子点可包含II-VI 族化合物半导体纳米晶体，ΠI-V族化合物半导体纳米晶体，IV-VI族化合物半导体纳米晶体，或其组合。在一些实施方式中，可将第二磷光剂层旋涂、喷涂、浸涂或丝网印刷到第一磷光剂层上。第二基质中第二磷光剂颗粒的示例性分布是约1%-约30重量％。在一些实施方式中，多层结构设置在与至少一个发光二极管相邻且位于其上方的位置;在其它实施方式中，多层结构反射和转换来自至少一 111, 5111,113, 〇7, 1〇311'111, ¥ 13 is, Jie, (:! 1, 81 and any one of 1, (5 & pools] \%) 25,104,511 particles] \ 1 ( Si 151) Qin: particles was 11, wherein Μ is Ca, Sr, or Ba, CaS:. Eu particles, and combinations of the exemplary first phosphor particles include, but are not limited to cerium-doped yttrium aluminum garnet (of Ce: a YAG), and other suitable yellow phosphor. in other embodiments, the first phosphor layer and second phosphor layer or a phosphor layer and second phosphor layer comprises a quantum dot. exemplary quantum dots may comprise group II-VI compound semiconductor nanocrystals, ΠI-V compound semiconductor nanocrystals, IV-VI compound semiconductor nanocrystals, or a combination thereof. in some embodiments, the second phosphor layer may be spin coating, spray coating, dip coating, or screen printed onto a first phosphor layer a second matrix the second exemplary distribution of phosphor particles is about 1% - about 30 wt%, in some embodiments, the multilayer structure is provided with at least one. a light emitting diode located adjacent to and above the location; in other embodiments, the conversion from the multilayer structure and at least one reflection 发光二极管的入射光。在另一种实施方式中，多层结构包含在第二磷光剂层上方的封盖层，其中封盖层基本上没有任何磷光剂颗粒。示例性第二磷光剂层可具有小于约50mJ/m 2的低表面能。在一些实施方式中，沉积的层的低表面能可小于约40mJ/m2和甚至小于约30mJ/m 2。优选的实施方式提供约34mJ/m2的低表面能涂层。 Incident light emitting diodes. In another embodiment, the multilayer structure comprises a second capping layer over the phosphor layer, wherein the capping layer is substantially free of any phosphor particles. Exemplary second phosphor layer less than about 50mJ / m 2 of low surface energy. in some embodiments, the deposited layer is a low surface energy can be less than about 40mJ / m2, and even less than about 30mJ / m 2. the preferred embodiment provides about 34mJ / m2 of low surface energy coating. 本发明的其它实施方式包含照明装置，其具有至少一个发光二极管和多层结构， 该至少一个发光二极管适于发射峰值波长在可见光谱中的基色光。  Other embodiments of the present invention comprises a lighting device having at least one light emitting diode and a multilayer structure, which is adapted to the at least one light emitting diode group emission peak wavelength in the visible spectrum color light. 该多层结构可包含第一磷光剂层和第二磷光剂层，该第一磷光剂层包含在整个第一基质中分布的发射黄光的磷光剂颗粒，该第二磷光剂层与第一磷光剂层接触并包含在整个第二基质中分布的发射红光的磷光剂颗粒，由此第二基质包含倍半硅氧烷主体材料、溶胶-凝胶主体材料或碱/硅酸盐水玻璃主体材料，和由此第二磷光剂层不包含陶瓷氧化物前体。 The multilayer structure may include a first phosphor layer and second phosphor layer, the phosphor layer comprises a first yellow-emitting phosphor particles distributed throughout the first matrix, the first and the second phosphor layer a contact layer comprising a phosphor and red-emitting phosphor particles distributed throughout the second matrix, whereby the second substrate main body comprises a silsesquioxane material sol - gel material body or base / silicate waterglass host material, and whereby the second phosphor layer does not comprise an oxide ceramic precursor thereof. 在各种实施方式中，输出波长可确定为随下述因素变化的函数:第二基质中第二磷光剂颗粒的加载量，第二磷光剂层的厚度，第一基质中第一磷光剂颗粒的加载量，第一磷光剂层的厚度，及其组合。 In various embodiments, the output may be determined as a function of wavelength with changes in such factors: loading a second matrix the second phosphor particles, thickness of the second phosphor layer, a first matrix of a first phosphor particles loading the thickness of the first phosphor layer, and a combination thereof. 示例性第二磷光剂颗粒包括但不限于56，了6)511，1^颗粒，其中1^可为恥，？ Exemplary second phosphor particles include but are not limited to 56, 6) 511,1 ^ particles, which may be shame ^ 1,? 111，5111，1'13,〇7，!1〇311'111，¥13^，(：1，81和1中的任一种， (SrBaMg) 2Si04: Eu 颗粒，M( AlSi )N3: Eu颗粒，其中Μ是Ca，Sr，或Ba，CaS: Eu 颗粒，及其组合。 示例性第一磷光剂颗粒包括但不限于铈掺杂的钇铝石榴石(Ce:YAG)，和其它合适的黄色磷光剂。在其它实施方式中，第一磷光剂层、第二磷光剂层或第一磷光剂层和第二磷光剂层包含量子点。示例性量子点可包含π-νι族化合物半导体纳米晶体，II ι-v族化合物半导体纳米晶体，IV-VI族化合物半导体纳米晶体，或其组合。在一些实施方式中，可将第二磷光剂层旋涂、喷涂、浸涂或丝网印刷到第一磷光剂层上。第二基质中第二磷光剂颗粒的示例性分布是约1%-约30重量％。在一些实施方式中，多层结构设置在与至少一个发光二极管相邻并且位于其上方的位置;在其它实施方式中，多层结构反射和转换来自至少一个发 111,5111,1'13, 〇7, 1〇311'111, ¥ 13 ^, (:! 1,81 and any one of 1, (SrBaMg) 2Si04: Eu particles, M (AlSi) N3: Eu particles, where Μ is Ca, Sr, or Ba, CaS: Eu particles, and combinations of the exemplary first phosphor particles include, but are not limited to cerium-doped yttrium aluminum garnet. (Ce: YAG), and other suitable yellow phosphor. in other embodiments, the first phosphor layer and second phosphor layer or a phosphor layer and second phosphor layer comprises a quantum dot. exemplary quantum dot may include π-νι compound semiconductor nano crystal, II ι-v compound semiconductor nanocrystals, IV-VI compound semiconductor nanocrystals, or a combination thereof. in some embodiments, the second phosphor layer may be spin coating, spray coating, dip coating or screen printing to . on the first phosphor layer a second matrix the second exemplary distribution of phosphor particles is from about 1% - about 30 wt%, in some embodiments, the multilayer structure is provided with at least one light emitting diode is located adjacent to and. above which; in other embodiments, the reflection and the multilayer structure made from at least one conversion 二极管的入射光。在另一种实施方式中，多层结构包含在第二磷光剂层上方的封盖层，其中封盖层基本上没有任何磷光剂颗粒。示例性第二磷光剂层可具有小于约50mJ/m 2的低表面能。在一些实施方式中，沉积的层的低表面能可小于约40mJ/m2和甚至小于约30mJ/m 2。优选的实施方式提供约34mJ/m2的低表面能涂层。 Diode incident light. In another embodiment, the multilayer structure comprises a second capping layer over the phosphor layer, wherein the capping layer is substantially free of any phosphor particles. Exemplary second phosphor layer may have less than about 50mJ / m 2 low surface energy. in some embodiments, the deposited layer is a low surface energy can be less than about 40mJ / m2, and even less than about 30mJ / m 2. the preferred embodiment provides a low of about 34mJ / m2 of surface energy coating. 在一个实验中，产生示例性硅酸盐-甲基硅氧烷聚合物(例如，旋涂在玻璃树脂上的512B，~10%聚合物，<2cP，霍尼韦尔(Honeywell))，其具有10重量％的红色磷光剂材料的加载量。  In one experiment, to produce an exemplary silicate - methyl siloxane polymer (e.g., spin-coated on a glass resin 512B, ~ 10% polymer, <2cP, Honeywell (Honeywell) ), having a loading of 10% by weight of a red phosphor material. 添加额外的溶剂例如IPA、水等来增加粘度。 Adding additional solvent such as IPA, water and the like to increase the viscosity. 使用旋涂机械装置在lOOOrpm下旋涂30秒，将该混合物旋涂到下面的基材上。 Mechanical means using a spin coater at lOOOrpm spin-coated for 30 seconds and the mixture was spin coated onto an underlying substrate. 观察到基材上的涂层均匀性不良，因为主体快速干燥且因为粘度较大的磷光剂颗粒(大于1〇μπι)保留在主体的表面。 Poor uniformity of the coating was observed on the substrate, and dried as quickly as the body the viscosity of the phosphor particle surface (greater than 1〇μπι) remains in the body. 此外，观察到很少颜色变化或没有颜色变化。 Further, a color change was observed little or no color change. 在第二个实验中，产生另一种硅酸盐-甲基硅氧烷聚合物，其具有0.1-1%乙二醇(或甘油)来增加它们的粘度，并具有10重量％的红色磷光剂材料的加载量。  In a second experiment, produce another silicate - methyl siloxane polymer, having 0.1% ethylene glycol (or glycerine) to increase the viscosity thereof, and having a 10 wt% the loading amount of the red phosphor material. 使用旋涂机械装置在lOOOrpm下旋涂30秒，将该混合物旋涂到下面的基材上。 Mechanical means using a spin coater at lOOOrpm spin-coated for 30 seconds and the mixture was spin coated onto an underlying substrate. 观察到相对于第一个实验， 涂层均匀性有改善，且较大磷光剂颗粒(大于1〇μπι)仍然保留在其表面上。 Was observed with respect to the first experiment, improved coating uniformity, and the larger phosphor particles (greater than 1〇μπι) remains on the surface thereof. 在后续的在空气中于430Γ下固化约1小时的固化过程之后，还观察到颜色变化。 After subsequent 430Γ in air for about 1 hour to cure the curing process, further color change is observed. 在第三个实验中，获得HardSilAM可固化的聚倍半硅氧烷T-树脂聚合物（19-21 % 固体，粘度5_15cSt.，动态粘度约4-14cP)并在其中混合10重量％的红色磷光剂材料。  In a third experiment, obtained HardSilAM curable T- polysilsesquioxane polymer resin (19-21% solids, viscosity 5_15cSt., Dynamic viscosity about 4-14cP) and mixed therein 10 wt. % of a red phosphor material. 使用旋涂机械装置在lOOOrpm下旋涂30秒，将该混合物旋涂到下面的基材上，然后根据预定的加热方案进行固化，即将该结构在50°C下固化，然后以40°C/分钟的速率将温度增加到240°C， 由此将该结构固化0.5小时。 Mechanical means using a spin coater at lOOOrpm spin-coated for 30 seconds and the mixture was spin coated onto the underlying substrate, and then cured in accordance with a predetermined heating schedule, i.e. the structure is cured at 50 ° C, then 40 ° C / the temperature was increased to a rate of minute 240 ° C, 0.5 hours whereby the cured structure. 然后，以5°C/分钟的速率将温度增加到430°C，由此将该结构固化1小时。 Then, at a rate of 5 ° C / min the temperature was increased to 430 ° C, whereby the structure of the cured for 1 hour. 然后，使温度以5 °C/分钟的速率下降到60 °C。 Then, the temperature at a rate of 5 ° C / minute down to 60 ° C. 使用旋涂机械装置在1 OOOrpm下旋涂30秒，将该混合物的第二涂层旋涂到基材上。 Mechanical means using a spin coater at 1 OOOrpm spin-coated for 30 seconds, the second coating mixture was spin coated onto the substrate. 然后，将HardSilAM可固化的聚倍半硅氧烷T-树脂聚合物封盖层旋涂到该第二涂层上作为封盖层，该复合材料根据相同的加热方案进行固化。 Then, the curable HardSilAM polysilsesquioxane polymer resin T- capping layer spin coated onto the second coating layer as the capping layer, the cured composite material according to the same heating schedule. 测量得到该复合材料的量子效率(QE)大于85%，这表明固化方案和任何与倍半硅氧烷聚合物的相互作用不降解红色磷光剂材料。 Of the composite measured quantum efficiency (QE) of greater than 85%, indicating that the red phosphor material is cured and any programs interact with the silsesquioxane polymer is not degraded. 获得该复合材料的颜色点信息，并在图9中进行作图。 Obtaining information on a color point of the composite, and plotted in FIG. 图9是色度图或颜色表，其显示根据本发明的一些实施方式的与眼睛响应卷积的各种颜色点。 9 is a chromaticity diagram or color table, which shows various color point in response to the convolution of the eye according to some embodiments of the present invention. 参考图9,可知YAG:Ce颜色点90位于570nm处，而具有在倍半硅氧烷主体中的HardSilAM树脂的在YAG上的红色实施方式提供另一个颜色点92。 Referring to Figure 9, seen YAG: Ce 90 to provide a color point to another color point Red 92 embodiment has HardSilAM silsesquioxane resin body is located in the YAG at 570nm, and. 红色磷光剂材料叠置于YAG基材上的一些实施方式具有512B主体并如在第三个实验中所述进行处理，其呈现示例性颜色点94。 A red phosphor material overlying some embodiments of the YAG substrate having a main body and 512B were processed as in the third experiment, presented as exemplary color points 94. 可通过随膜厚度和/或EuN加载量以及下面的基材中的YAG含量的变化来增加或减少红色磷光剂材料，从而获得颜色点94的移动，即发射的或转换的白光的改变。 It can vary with changes in membrane thickness and / or loading and EuN below a YAG substrate to increase or decrease the content of the red phosphor material, thereby obtaining a color point 94 moves, i.e., transmitted or converted white light. 还观察到相对于第一个实验和第二个实验，该第三复合材料的涂层均匀性有改善，且较大磷光剂颗粒(大于10M1)仍然保留在其表面上。 Also observed with respect to the first and second experimental test, the uniformity of the coating of the third composite improved, and the larger phosphor particles (greater than 10m1) remains on the surface thereof. 在固化过程中没有观察到颜色变化。 No color change was observed during curing. 还形成QE数据，用于额外的实验。  QE further data is formed, for additional experiments. 在这些测量中，将示例性QE测量系统的虹膜(ir is)拓宽到约2 · 2mm X 0 · 5mm的斑点尺寸，其中YAG流延浇铸的样品测量为102 · 2 % (校正到96%)。 In these measurements, the iris exemplary QE measurement system (ir is) widened to about 2 · 2mm X 0 · 5mm spot size, wherein the YAG casting cast sample measured 102 · 2% (corrected to 96%) . 表1提供一些实施方式的QE测量的列表，其具有在下面的黄色磷光剂基材上形成层的Eu/N倍半硅氧烷旋涂的红色磷光剂材料，并在空气中于约430°C下固化1小时。 Table 1 provides a list of some embodiments of the QE measurements, a red phosphor having a Eu material layer formed on the substrate below the yellow phosphor / N silsesquioxane spin coating, and air at about 430 ° C cured for 1 hour. 图10是量子效率与温度的关系图。  FIG. 10 is a relationship between the quantum efficiency and temperature in FIG. 参考图10,如上所述地在倍半硅氧烷主体中提供红色磷光剂粉末并旋涂。 Referring to FIG 10, as described above, to provide a red phosphor powder silsesquioxane body and spin coated. 在该实验中，固化条件是在空气中于室温下、约250°C，430°C，和600°C下固化1小时。 In this experiment, the curing conditions at room temperature, cured at about 250 ° C, 430 ° C, and 600 ° C 1 hours in air. 如图所示，从430°C拐点到600°C，QE显著降低，但在低于430°C时基本上保持相同。 As shown, an inflection point from 430 ° C to 600 ° C, QE significantly reduced, but below 430 ° C remains substantially the same. 因此，直到约430°C，对于本发明的实施方式的热稳定性没有观察到显著变化，且还观察到在磷光剂材料与主体材料直接不存在反应性，然而，在与用于制备主体的分散剂直接观察到一些反应性。 Thus, up to about 430 ° C, for the embodiment of the present invention is the thermal stability of a significant change was not observed, and also no reactivity was observed in the presence of phosphor material directly with the host material, however, it used to prepare the body dispersant directly observe some reactivity. 在其它实验中，获得HardSilAM可固化的聚倍半硅氧烷T-树脂聚合物（19-21 %固体，粘度5_15cSt.，动态粘度约4-14cP)并在其中混合量子点。  In other experiments, obtained HardSilAM curable T- polysilsesquioxane polymer resin (19-21% solids, viscosity 5_15cSt., Dynamic viscosity about 4-14cP) and mixed therein quantum dots. 将示例性、非限制性的量子点材料具有CdSe-Zn壳的QSP650nm添加到聚合物主体，这得到主体中的15-62mg/ml的量子点浓度。 Add the exemplary, non-limiting quantum dot material having CdSe-Zn QSP650nm shell polymer to the body, the body which results in a quantum dot concentration 15-62mg / ml of. 使用旋涂机械装置在lOOOrpm下旋涂10秒，将该混合物旋涂到下面的基材上，然后将HardSilAM可固化的聚倍半硅氧烷T-树脂聚合物封盖层旋涂到该第二涂层上作为封盖层。 Mechanical means using a spin coater at lOOOrpm spin coated for 10 seconds, the mixture was spin coated onto the underlying substrate, then HardSilAM curable T- polysilsesquioxane polymer resin to cover the second layer of spin as the capping layer on the titanium coating layer. 然后，该复合材料根据预定的加热方案进行固化，即该结构在120Γ下固化，然后在240Γ下固化。 Then, the composite material in accordance with a predetermined heating profile for the curing, i.e. the curing in the structure 120Γ, and then cured in 240Γ. 然后，以5°C/分钟的速率将温度增加到430°C，由此将该结构固化1小时。 Then, at a rate of 5 ° C / min the temperature was increased to 430 ° C, whereby the structure of the cured for 1 hour. 然后，使温度以5°C/分钟的速率下降到60°C。 Then, the temperature at a rate of 5 ° C / minute down to 60 ° C. 在另一组样品中，将示例性、非限制性的量子点材料具有CdSe-Zn壳的QSP650nm添加到聚合物主体，这得到主体中的15-62mg/ml的量子点浓度。 QSP650nm In another set of samples, an exemplary, non-limiting quantum dot material having a shell CdSe-Zn added to the polymer body, which give the body a quantum dot concentration 15-62mg / ml of. 使用旋涂机械装置在lOOOrpm下旋涂10秒，将该混合物旋涂到下面的基材上。 Mechanical means using a spin coater at lOOOrpm spin coated for 10 seconds, the mixture was spin coated onto an underlying substrate. 没有添加封盖层。 Not added capping layer. 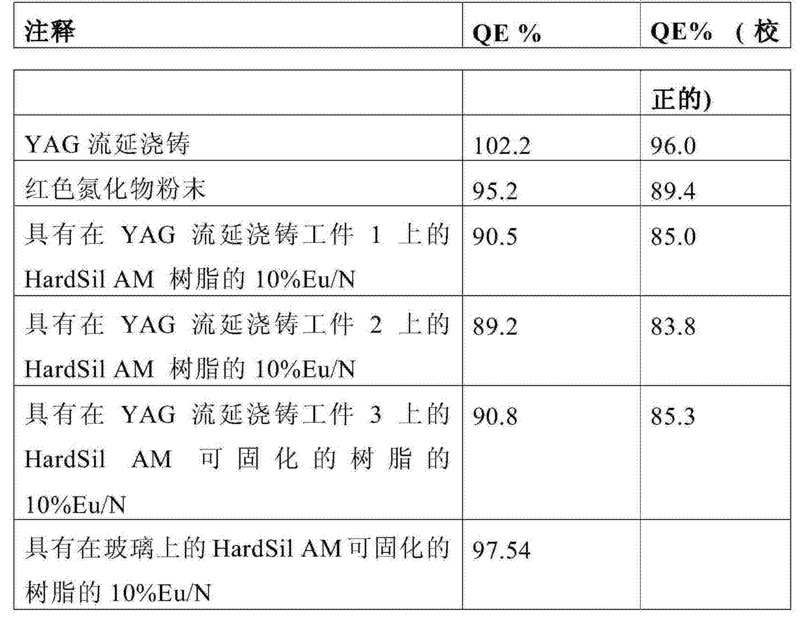 这样获得用于QSP650粉末的QE是50% (根据制造商），且发现随着固化温度增加，这些复合材料中的每一种的QE是26-35%。 QE for QSP650 thus obtained powder was 50% (according to the manufacturer), and found that as the curing temperature increases, the composite material of each of QE is 26-35%. 虽然本说明书可包括许多细节，但这些细节不应构成其范围的限制，相反这些特征的描述可对于特定实施方式而所特有的。  While the specification may include many specifics, these specifics should not be construed to limit its scope, but rather to describe features of certain embodiments may be specific manner. 在本说明书的单独的实施方式中描述的某些特征也可以组合起来在单个实施方式中实现。 Certain features described in the separate embodiment of the present description may also be implemented in combination in a single embodiment. 反之，在单一实施方式的内容中描述的各种特征也可以在多个实施方式中独立地或者以任何适当次级组合的形式实现。 Conversely, various features of embodiments described in the context of a single embodiment may also be implemented in the embodiment a plurality of independently or in any suitable sub-combination. 而且，虽然上述特征被描述成以某些组合的形式起作用，而且甚至最初也是这样要求权利的，但所要求权利的组合中的一种或多种特征在一些情况下可以从该组合中去除，所要求权利的组合可以针对次级组合或者次级组合的变化。 Further, although the above features are described as acting in certain combinations and even initially claimed as such rights, but the claimed combination of one or more features from the combination may be removed in some cases , the claimed composition can vary for a secondary or a combination of a secondary combination. 类似地，虽然在附图中以特定的顺序显示操作，但这不应理解为要求这些操作按照所示的特定顺序或按照先后顺序来实施，或者实施所有所示的操作来获得所需的结果。  Similarly, while a display operation in a particular order in the drawings, but it should not be understood as requiring that such operations in accordance with the particular order shown or in sequential order implemented, or all the operation illustrated embodiment is obtained by required results. 在一些实施方式中，多任务和平行的加工可为优选的。 In some embodiments, multitasking and parallel processing may be preferable. 如通过图1-13中所述的各种构造和实施方式所示，描述了发光涂层和装置的各种实施方式。  The various embodiments and configurations of the embodiment shown in FIG. 1-13, describes various embodiments of a light emitting device and the coating. 虽然已描述了本发明的优选的实施方式，但应理解所述的实施方式只是说明性的，本发明的范围仅仅由所附权利要求来限定，当给予全范围的等同体时，本领域普通技术人员自然地可进行许多修改和变化。  While there has been described a preferred embodiment of the present invention, but it should be understood that the embodiments are merely illustrative, the scope of the present invention is limited only by the appended claims, when the full range of equivalents given, Those of ordinary skill in the art naturally many modifications and variations may be made. 1. 一种波长转换板，其包含： 第一磷光剂层，该第一磷光剂层包含分布于第一基质中的第一磷光剂颗粒;和第二磷光剂层，该第二磷光剂层包含分布于第二基质中的第二磷光剂颗粒;和其中第二磷光剂层与第一磷光剂层物理接触，和其中该第二基质包含倍半硅氧烷主体材料、倍半硅氧烷-硅酸盐主体材料、溶胶-凝胶主体材料或碱/硅酸盐水玻璃主体材料。 A wavelength converting plate, comprising: a first phosphor layer, said first phosphor layer comprises phosphor particles distributed in a first of the first matrix; and a second phosphor layer, the second phosphor layer distributed in the second matrix comprises a second phosphor particles; and wherein the second phosphor layer is in contact with the first physical phosphor layer, and wherein the second matrix comprises a host material silsesquioxane, silsesquioxane - silicate host material, the sol - gel material body or base / silicate waterglass host material. 2. 如权利要求1所述的波长转换板，其特征在于，第一磷光剂颗粒包含发射黄光的磷光剂颗粒，第二磷光剂颗粒包含发射红光的磷光剂颗粒。 2. The wavelength conversion panel according to claim 1, wherein the first phosphor particles comprise yellow light emitting phosphor particles, the phosphor particles comprise a second phosphor particle emits red light. 3. 如权利要求2所述的波长转换板，其特征在于，第二磷光剂层不包含陶瓷氧化物前体。 3. The wavelength conversion panel according to claim 2, wherein the second phosphor layer does not comprise a ceramic oxide precursor. 4. 如权利要求1所述的波长转换板，其特征在于，输出波长作为下述至少一种的函数来确定:第二基质中第二磷光剂颗粒的加载量、第二磷光剂层的厚度、第一基质中第一磷光剂颗粒的加载量、第一磷光剂层的厚度及其组合。 Loading a second matrix the second phosphor particles, thickness of the second phosphor layer: wavelength conversion panel as claimed in claim 1, wherein the output wavelength is determined as a function of at least one of the following , loading a first phosphor particles of the first substrate, the thickness and composition of the first phosphor layer. 5. 如权利要求1所述的波长转换板，其特征在于，该波长板的厚度是约100微米-500微米。 5. The wavelength conversion panel according to claim 1, wherein the thickness of the wavelength plate is about 100 microns 500 microns. 7. 如权利要求1所述的波长转换板，其特征在于，第一磷光剂层和第二磷光剂层中的至少一种包含量子点，该量子点包含II-VI族化合物半导体纳米晶体、III-V族化合物半导体纳米晶体、IV-VI族化合物半导体纳米晶体或其组合。 7. The wavelength conversion panel according to claim 1, wherein the first phosphor layer and second phosphor layer comprising at least one quantum dot, the quantum dot including group II-VI compound semiconductor nanocrystals, group III-V compound semiconductor nanocrystals, IV-VI compound semiconductor nanocrystals, or a combination thereof. 8. 如权利要求1所述的波长转换板，其特征在于，第二磷光剂颗粒以约1%-约30重量％ 的加载量分布于第二基质中。 The wavelength conversion panel as claimed in claim 1, wherein the second phosphor particles are from about 1% - about 30 wt% of the distribution of loading in the second matrix. 9. 如权利要求1所述的波长转换板，其特征在于，还包含在第二磷光剂层上方的封盖层，其中该封盖层基本上没有任何磷光剂颗粒。 9. The wavelength conversion panel according to claim 1, characterized by further comprising a second capping layer over the phosphor layer, wherein the capping layer is substantially free of any phosphor particles. 10. 如权利要求1所述的波长转换板，其特征在于，第二磷光剂层具有小于约50mJ/m2、小于约40m J/m2或小于约30m J/m2的表面能。 10. The wavelength conversion panel according to claim 1, wherein the second phosphor layer having less than about 50mJ / m2, of less than about 40m J / m2, or about surface 30m J / m2 was smaller than an energy. 11. 一种照明装置，其包括： 至少一个发光二极管，该至少一个发光二极管适于发射峰值波长在可见光谱区中的基色光;和多层结构，该多层结构具有： 第一磷光剂层，该第一磷光剂层包含在第一基质中的第一磷光剂颗粒， 第二磷光剂层，该第二磷光剂层包含在第二基质中的第二磷光剂颗粒， 其中第二磷光剂层与第一磷光剂层物理接触，和其中该第二基质包含倍半硅氧烷主体材料、倍半硅氧烷-硅酸盐主体材料、溶胶-凝胶主体材料或碱/硅酸盐水玻璃主体材料。 A lighting apparatus, comprising: at least one light emitting diode, the at least one light emitting diode is adapted to emit primary light peak wavelength in the visible spectrum region; and a multilayer structure, the multilayer structure comprising: a first phosphor layer the first phosphor layer comprises phosphor particles of a first in a first matrix, a second phosphor layer, the second layer comprises a second phosphorescent phosphor particles in the second matrix, wherein the second phosphor a first phosphor layer is in contact with the physical layer, and wherein the second matrix comprises a host material silsesquioxane, silsesquioxane - silicate host material, the sol - gel material body or base / Portland cement glass host material. 12. 如权利要求11所述的照明装置，其特征在于，第一磷光剂颗粒包含发射黄光的磷光剂颗粒，第二磷光剂颗粒包含发射红光的磷光剂颗粒。 12. The illumination device of claim 11, wherein the first phosphor particles comprise yellow light emitting phosphor particles, the phosphor particles comprise a second phosphor particle emits red light. 13. 如权利要求12所述的照明装置，其特征在于，第二磷光剂层不包含陶瓷氧化物前体。 13. The lighting device according to claim 12, wherein the second phosphor layer does not comprise a ceramic oxide precursor. 14. 如权利要求11所述的照明装置，其特征在于，输出波长作为下述至少一种的函数来确定:第二基质中第二磷光剂颗粒的加载量、第二磷光剂层的厚度、第一基质中第一磷光剂颗粒的加载量、第一磷光剂层的厚度及其组合。 14. The lighting device according to claim 11, wherein the output wavelength as a function of at least one of the following is determined: loading a second matrix the second phosphor particles, thickness of the second phosphor layer, loading a first matrix of a first phosphor particles, a phosphor layer of a first thickness, and combinations thereof. 16. 如权利要求11所述的照明装置，其特征在于，第一磷光剂层和第二磷光剂层中的至少一种包含量子点，该量子点包含II-VI族化合物半导体纳米晶体、III-V族化合物半导体纳米晶体、IV-VI族化合物半导体纳米晶体或其组合。 16. The lighting device according to claim 11, wherein the first phosphor layer and second phosphor layer comprising at least one quantum dot, the quantum dot including group II-VI compound semiconductor nanocrystals, III -V compound semiconductor nanocrystals, IV-VI compound semiconductor nanocrystals, or a combination thereof. 17. 如权利要求11所述的照明装置，其特征在于，第二磷光剂颗粒以约1重量％-约30重量％的量分布于第二基质中。 17. The lighting device according to claim 11, wherein the second phosphor particles are from about 1 wt% - about 30 wt% of an amount distributed in the second matrix. 18. 如权利要求11所述的照明装置，其特征在于，该多层结构还包含在第二磷光剂层上方的封盖层，其中该封盖层基本上没有任何磷光剂颗粒。 18. The illumination device of claim 11, wherein the multilayer structure further includes a second capping layer over the phosphor layer, wherein the capping layer is substantially free of any phosphor particles. 19. 如权利要求11所述的照明装置，其特征在于，第二磷光剂层具有小于约50mJ/m2、小于约40m J/m2或小于约30m J/m2的表面能。 19. The lighting device according to claim 11, wherein the second phosphor layer having less than about 50mJ / m2, of less than about 40m J / m2, or about surface 30m J / m2 was smaller than an energy. 20. -种照明装置，其包括： 至少一个发光二极管，该至少一个发光二极管适于发射峰值波长在可见光谱区中的基色光;和多层结构，该多层结构具有： 第一磷光剂层，该第一磷光剂层包含在整个第一基质中分布的发射黄光的磷光剂颗粒， 第二磷光剂层，该第二磷光剂层与该第一磷光剂层接触，并包含在整个第二基质中分布的发射红光的磷光剂颗粒， 其中该第二基质包含倍半硅氧烷主体材料、倍半硅氧烷-硅酸盐主体材料、溶胶-凝胶主体材料或碱/硅酸盐水玻璃主体材料，和其中该第二磷光剂层不包含陶瓷氧化物前体。 20. - illumination device comprising: at least one light emitting diode, at least one group which is adapted to color light emission peak wavelength in the visible spectral region of the light emitting diode; and a multilayer structure, the multilayer structure comprising: a first phosphor layer the first yellow-emitting phosphor layer comprises phosphor particles distributed throughout the first matrix, the second phosphor layer, the second phosphor layer is in contact with the first phosphor layer, and included in the entire section red light emitting phosphor particles distributed in two matrix, wherein the matrix comprises a second host material silsesquioxane, silsesquioxane - silicate host material, the sol - gel body or base material / silica brine glass host material, and wherein the second front phosphor layer does not comprise a ceramic oxide precursor. 21. 如权利要求20所述的照明装置，其特征在于，该发射红光的磷光剂颗粒选自下组： (5『，〇&，8&，]\^)八151仏511，1^(1$叉$5)颗粒，（51〇&，8&，]\%)(5,56，丁6)士11，1^颗粒，其中Re 可为恥，卩111，5111，113,〇7，!1〇311'111，¥13^，(：1，81和1中的任一种，（5沾3]\%)25104 511颗粒，]\1 (A1 Si )N3: Eu颗粒，其中Μ是Ca，Sr，或Ba，CaS: Eu颗粒，及其组合，以及其中发射黄光的磷光剂颗粒包含Ce:YAG。 21. The lighting device according to claim 20, wherein the red-emitting phosphor particles are selected from the group consisting of: (5 ', & square, 8 &,] \ ^) eight 511,1 151 Fo ^ ( fork $ 1 $ 5) particles (& 51〇, 8 &,] \%) (5,56, D 6) 11,1 ^ persons particles, wherein Re may be shame, Jie 111,5111,113, 〇7 ,! 1〇311'111, ¥ 13 ^, (: 1,81 1 and any one of, (5 dip 3] \%) 25,104,511 particles,] \ 1 (A1 Si) N3: Eu particles, which is Μ Ca, Sr, or Ba, CaS: Eu particles, and combinations thereof, and wherein the yellow-emitting phosphor particles comprise Ce: YAG. 22. 如权利要求20所述的照明装置，其特征在于，第一磷光剂层、第二磷光剂层、或者第一磷光剂层和第二磷光剂层包含量子点，且其中该量子点包含II-VI族化合物半导体纳米晶体、III-V族化合物半导体纳米晶体、IV-VI族化合物半导体纳米晶体或其组合。 22. The lighting device according to claim 20, wherein the first phosphor layer and second phosphor layer, or the first phosphor layer and second phosphor layer comprising quantum dots, and wherein the quantum dot comprises group II-VI compound semiconductor nanocrystals, III-V compound semiconductor nanocrystals, IV-VI compound semiconductor nanocrystals, or a combination thereof. 23. 如权利要求20所述的照明装置，其特征在于，发射红光的磷光剂颗粒以约1重量％-约30重量％的量分布于第二基质中。 23. The lighting device according to claim 20, wherein the red-emitting phosphor particles from about 1 wt% - about 30% by weight of an amount distributed in the second matrix. 24. -种组合第一磷光剂材料和第二磷光剂材料的方法，所述方法包括以下步骤： 提供第一磷光剂材料； 组合第一磷光剂材料与主体基质来构建第一磷光剂混合物； 在一种或多种预定的温度下固化第一磷光剂混合物;和将固化的第一磷光剂混合物沉积到具有第二磷光剂材料的基材上。 24. - Method phosphor combination of a first material and a second phosphor material, the method comprising the steps of: providing a first phosphor material; a first phosphor material in combination with the phosphor host matrix to build a first mixture; the first phosphor curing agent mixture in one or more predetermined temperature; a first agent and a mixture of the cured phosphor deposited onto the substrate having a second phosphor material. 25. 如权利要求24所述的方法，其特征在于，沉积的步骤包含旋涂、喷涂、浸涂或丝网印刷。 25. The method according to claim 24, wherein the step of depositing comprises spin coating, spray coating, dip coating or screen printing. 26. 如权利要求24所述的方法，其特征在于，第一磷光剂混合物不包含陶瓷氧化物前体。 26. The method according to claim 24, wherein the first phosphor mixture does not comprise a ceramic oxide precursor. 27. 如权利要求24所述的方法，其特征在于，该第一磷光剂材料选自下组：（Sr，Ca，Ba， 1%)厶131心511，1^(1$叉$5)颗粒，（31〇3,8&，]\%)(3,36，丁6)511，1^颗粒，其中1^可为恥， 卩111，5111，113,〇7，!1〇311'111，¥13^，(：1，81和1中的任一种，（5沾&]\%)25104 511颗粒，]\1(厶151)吣： Eu颗粒，其中Μ是Ca，Sr，或Ba，CaS: Eu颗粒，及其组合，其中该主体基质包含倍半硅氧烷主体材料、倍半硅氧烷-硅酸盐主体材料、溶胶-凝胶主体材料或碱/硅酸盐水玻璃主体材料，以及其中第二磷光剂颗粒包含Ce:YAG。 27. The method according to claim 24, wherein the first phosphor material is selected from the group consisting of: (Sr, Ca, Ba, 1%) 131 heart 511,1 ^ Si (1 $ 5 $ forks) particles , (31〇3,8 &,] \%) (3,36, D 6) 511,1 ^ particles, wherein 1 ^ can shame, Jie 111,5111,113, 〇7,! 1〇311'111, ¥ 13 ^, (: 1,81 1 and any one of, (5 & dip] \%) 25,104,511 particles] \ 1 (Si 151) Qin: Eu particles, wherein Μ is Ca, Sr, or Ba , CaS: Eu particles, and combinations thereof, wherein the host matrix comprises a host material silsesquioxane, silsesquioxane - silicate host material, the sol - gel base material or a body / body silicate waterglass materials, and wherein the phosphor particles comprise a second Ce: YAG.